After parting ways with his brother Charles at the Duryea Motor Wagon Co., J. Frank Duryea set off on his own to form Hampden Automobile & Launch Co. in Springfield, Massachusetts. 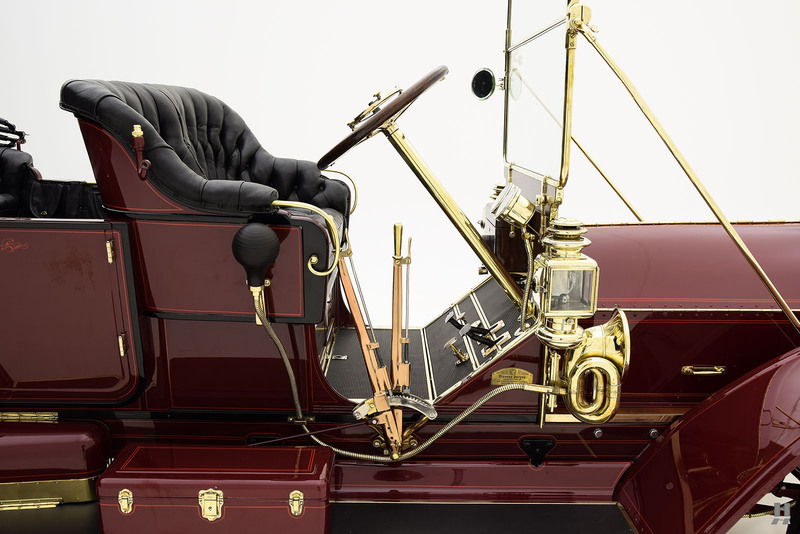 Soon after setting up shop, with the very first prototype just completed, the J. Stevens Arms & Tool Company acquired a controlling interest in the business and the Hampden car was renamed Stevens-Duryea. 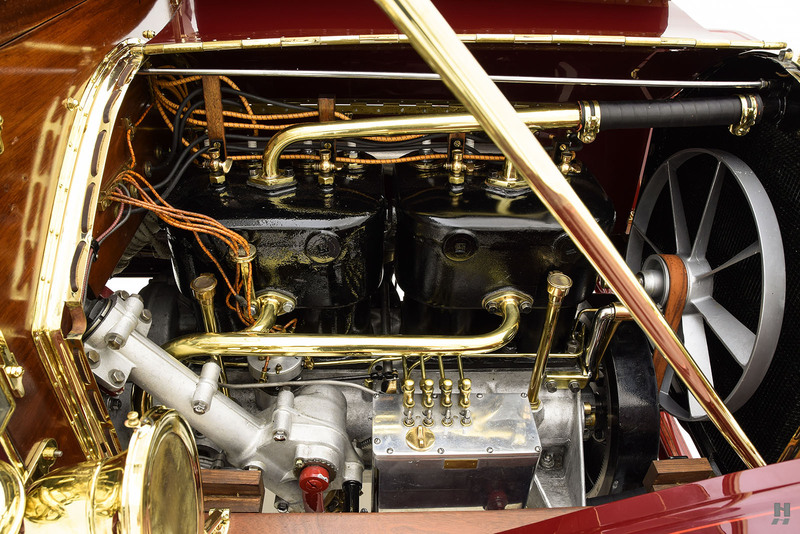 The original Hampden prototypes were simple, 2-cylinder runabouts with tiller steering, and once they were refined for production, sold for about $1200 under the Stevens-Duryea name. 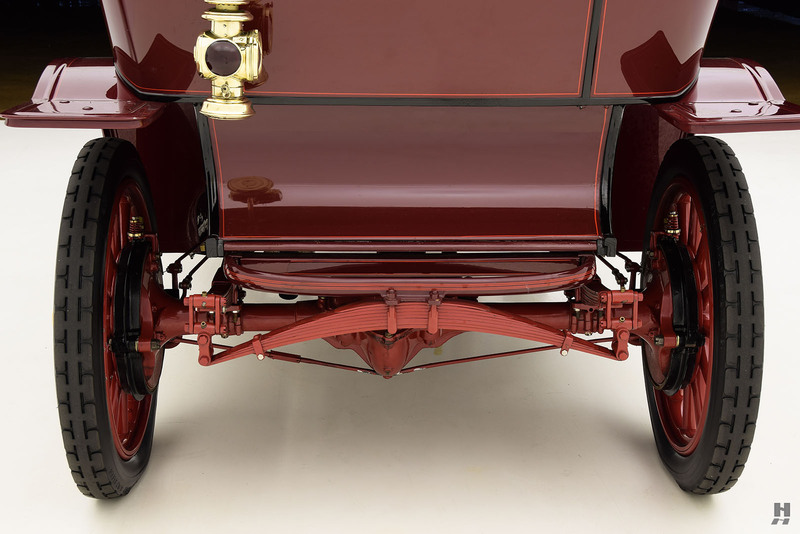 Rapid development saw the Stevens-Duryea range gain a 20hp four-cylinder engine with unique three-point engine mounting system in 1905, which the company touted as providing superior protection to the drivetrain on rough roads. 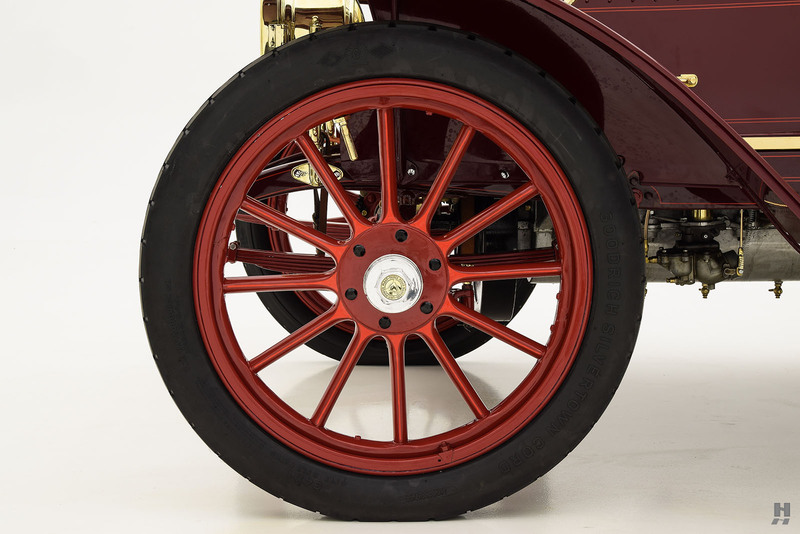 Period advertising boasted their success at hillclimb events against cars of twice the horsepower output and claimed “In order to get all of your engine power to the rear wheels, you must have a STEVENS-DURYEA THREE POINT SUSPENSION”. 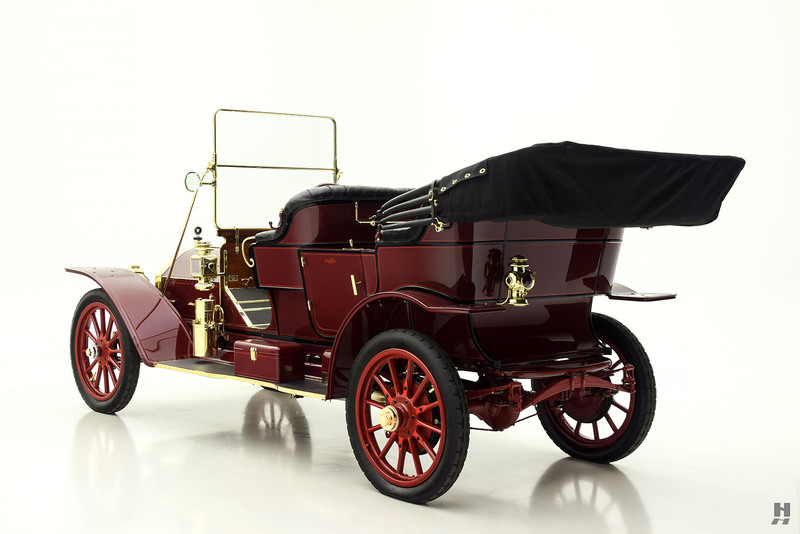 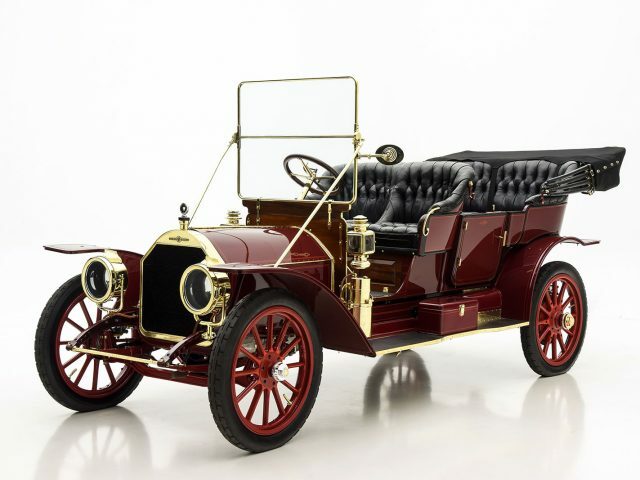 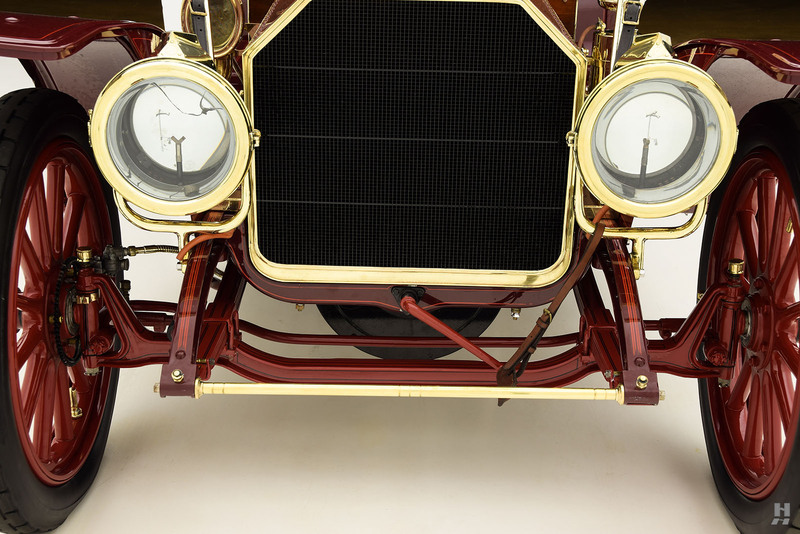 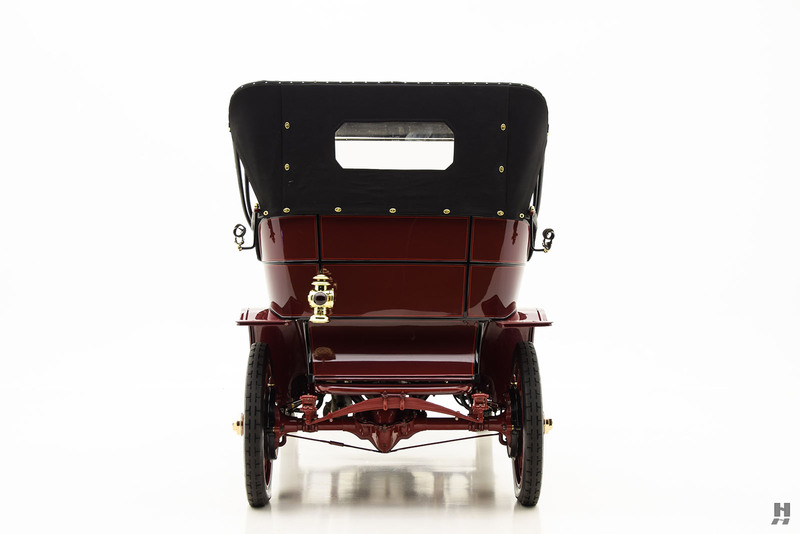 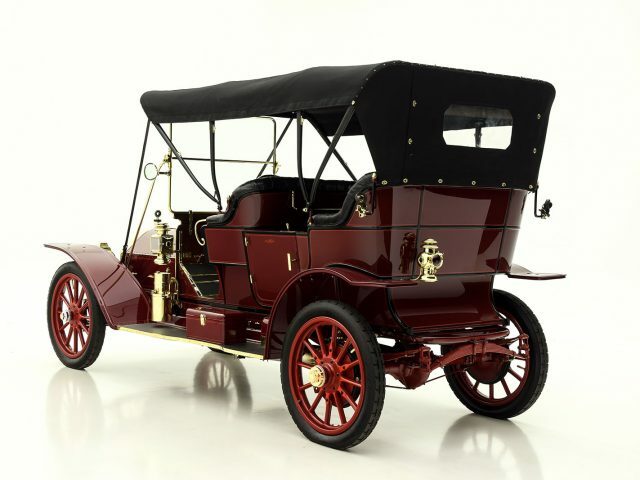 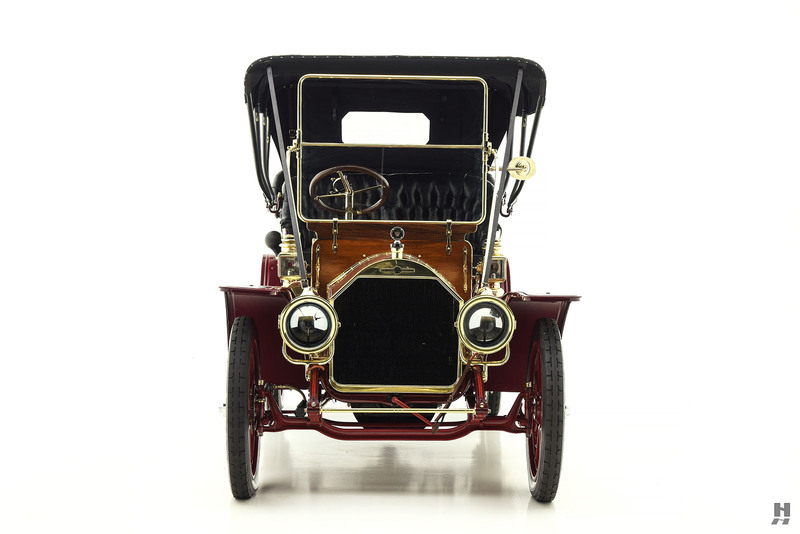 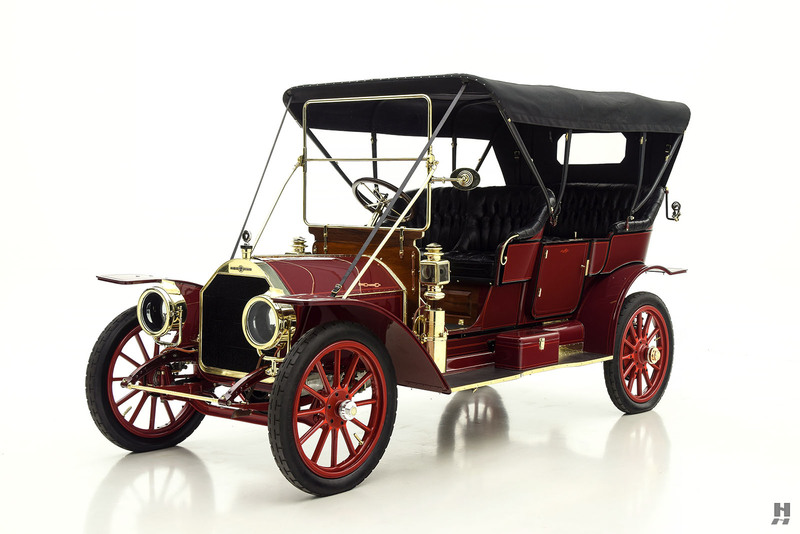 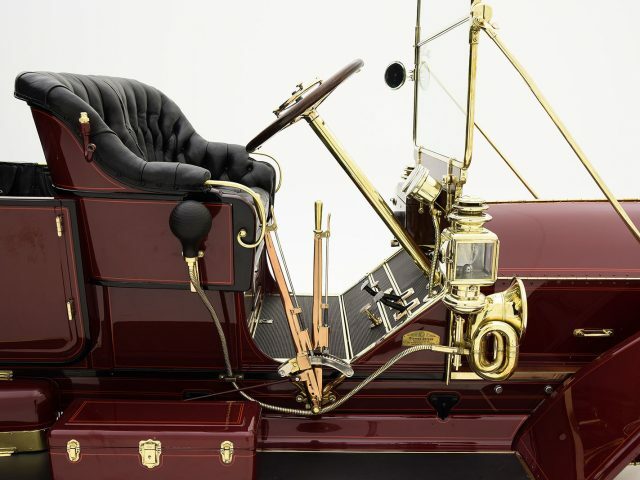 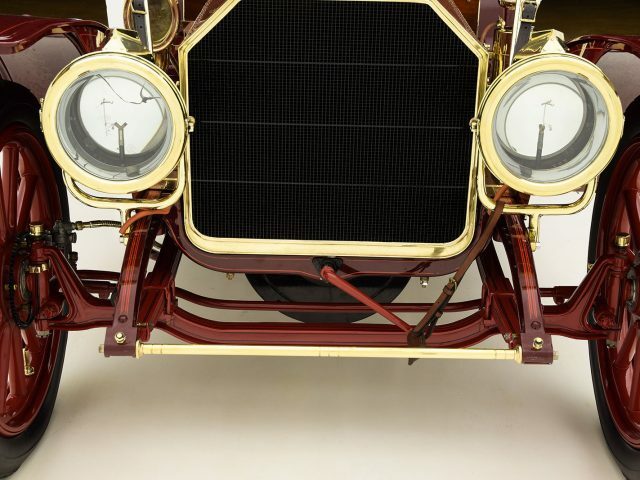 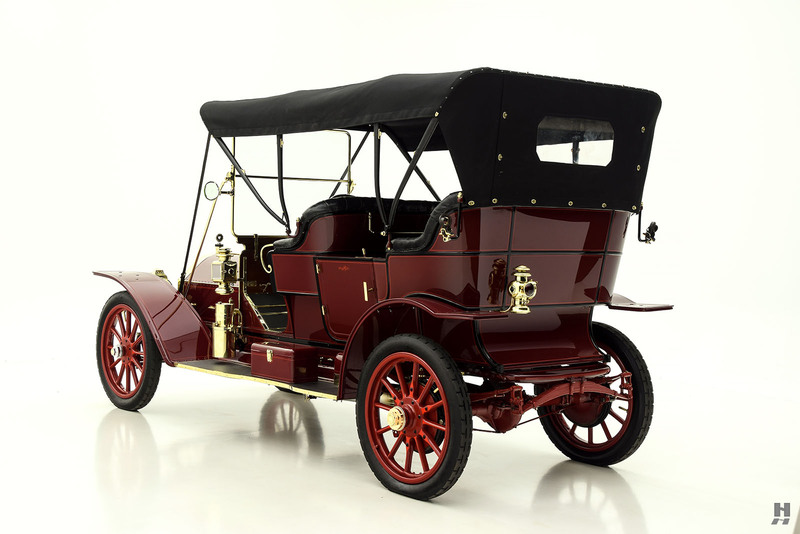 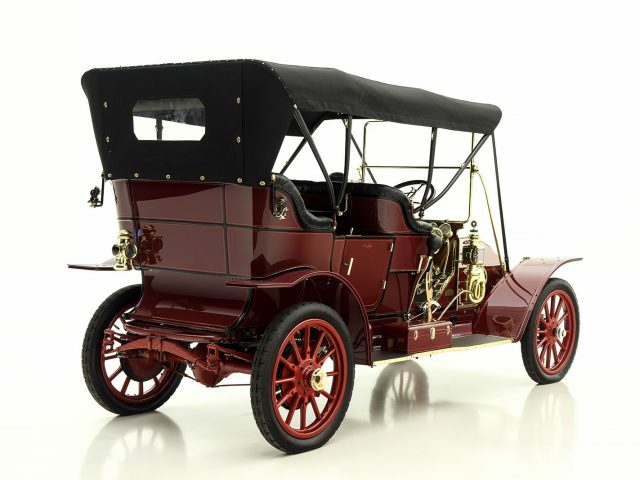 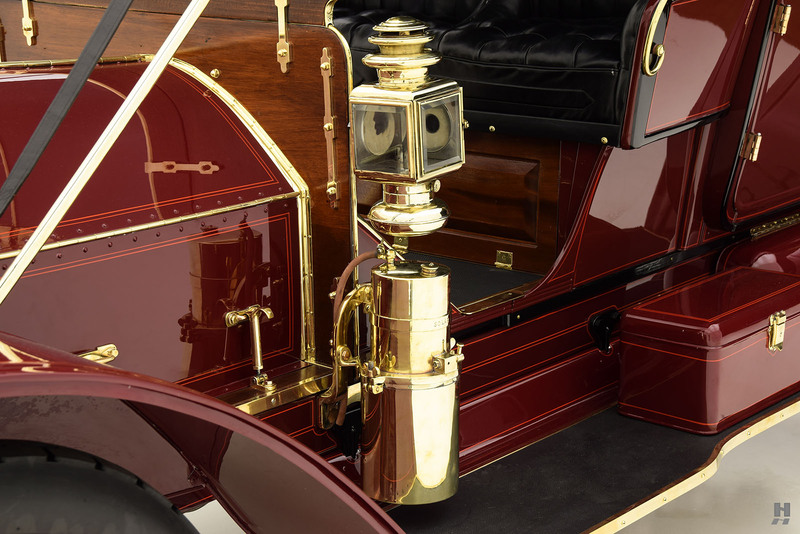 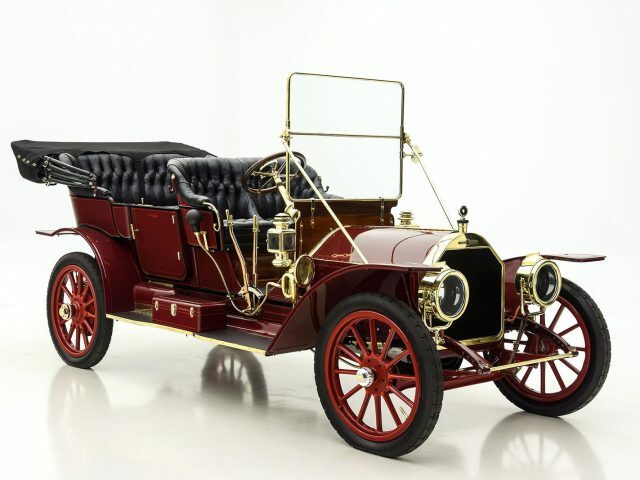 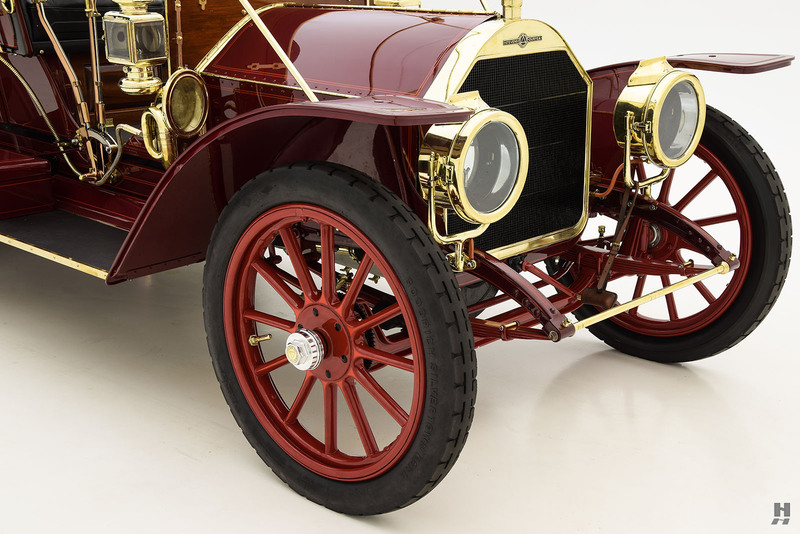 As early as 1906, Stevens-Duryea offered both four and six cylinder models that helped the company quickly move up market. 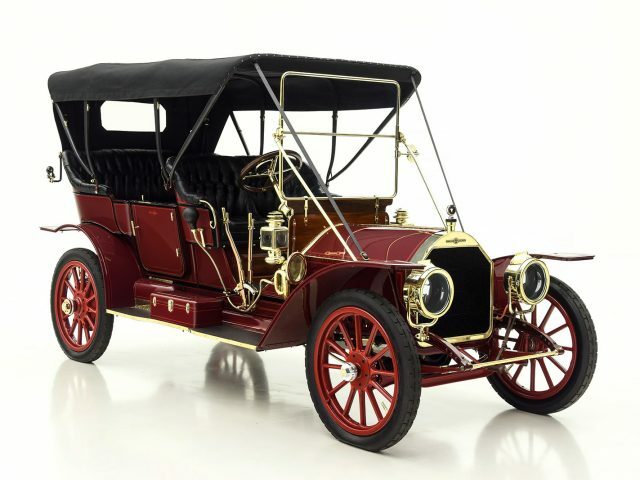 By 1915, financial troubles had struck and despite selling off the armament side of the business to raise capital, banks and creditors demanded J. Frank Duryea build less expensive models if he were to receive any more capital – a condition that he refused to accept. 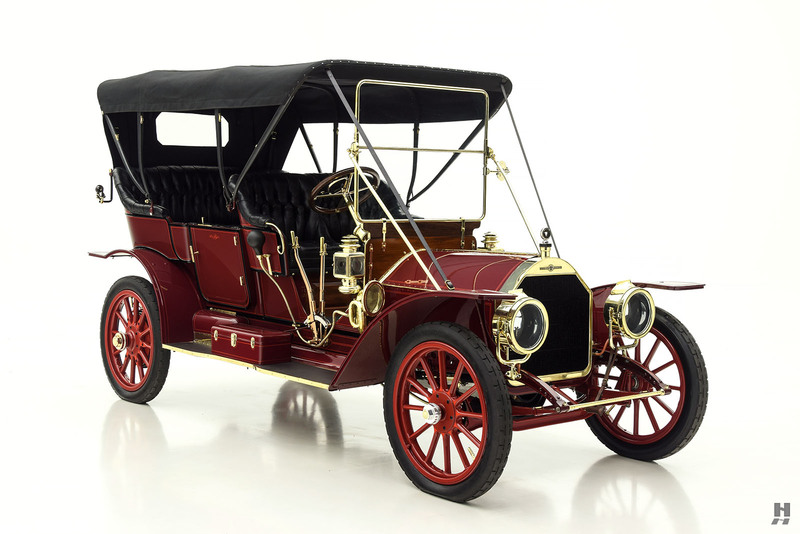 As a result, the plant was sold to Westinghouse to support domestic efforts for World War I. 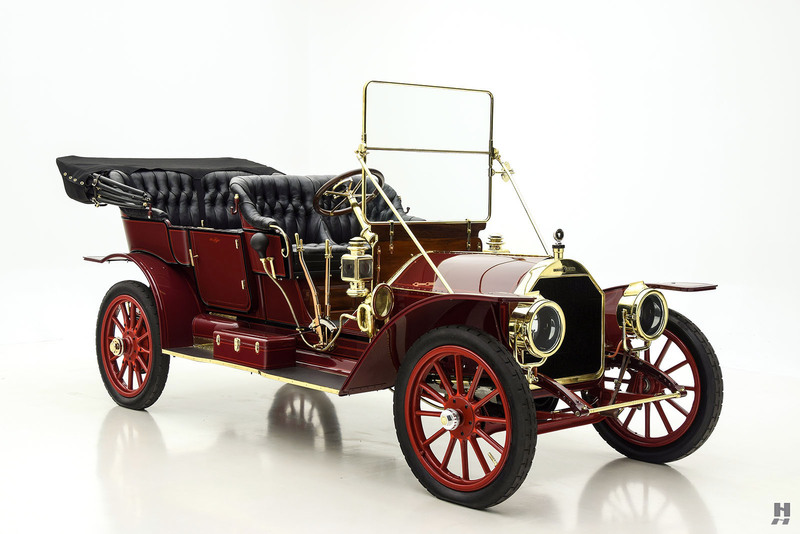 In 1919 a group of former employees led by Ray S. Deering bought the rights to the Stevens-Duryea name and revived production. 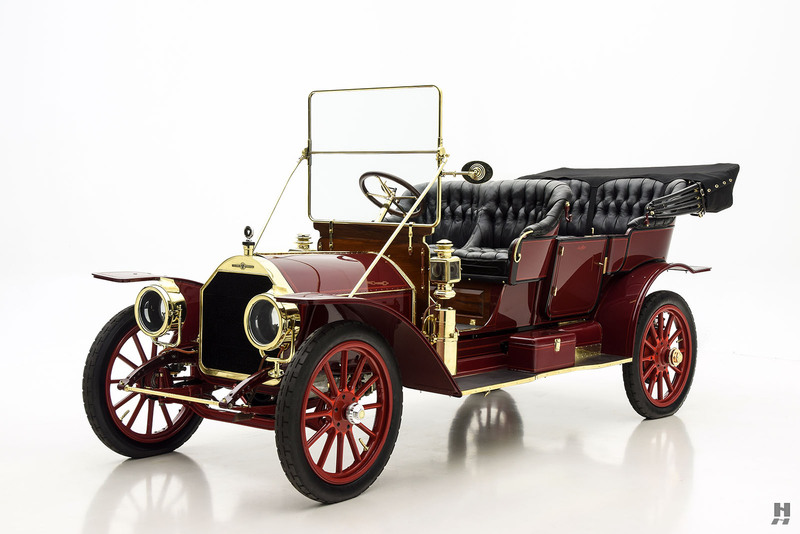 Incidentally, Mr. Deering later went on to purchase Rauch and Lang, makers of electric cars. 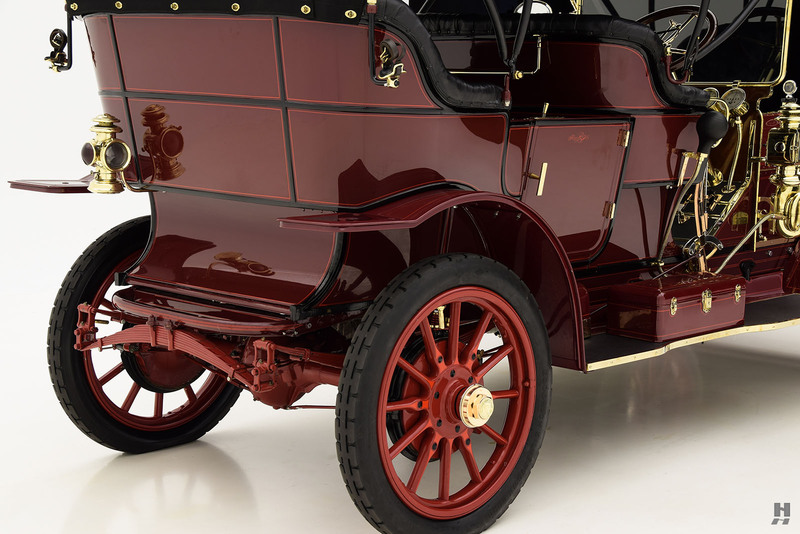 Unfortunately for Mr. Deering, the refreshed and updated version of the old Model S was not enough to keep the business afloat, especially considering inflation caused the price to climb to an astounding $9500 in 1920. 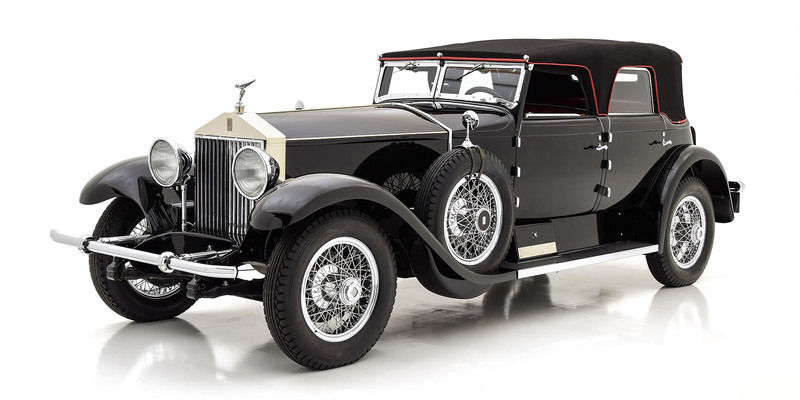 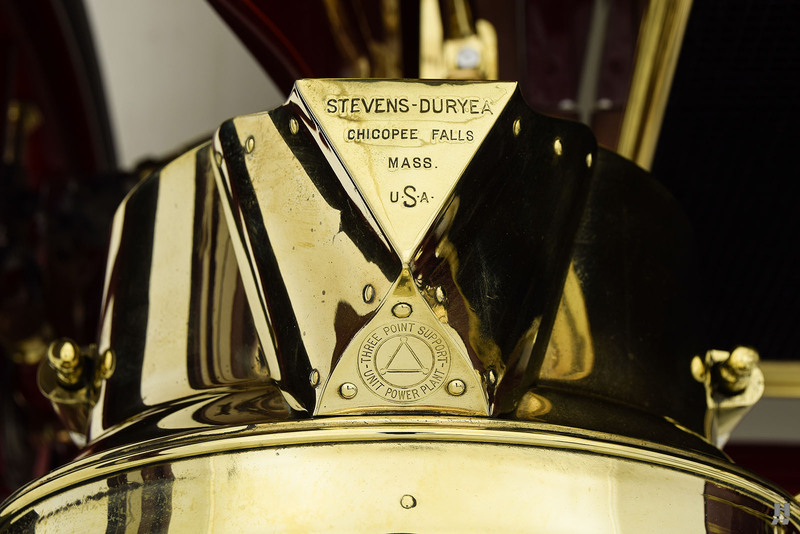 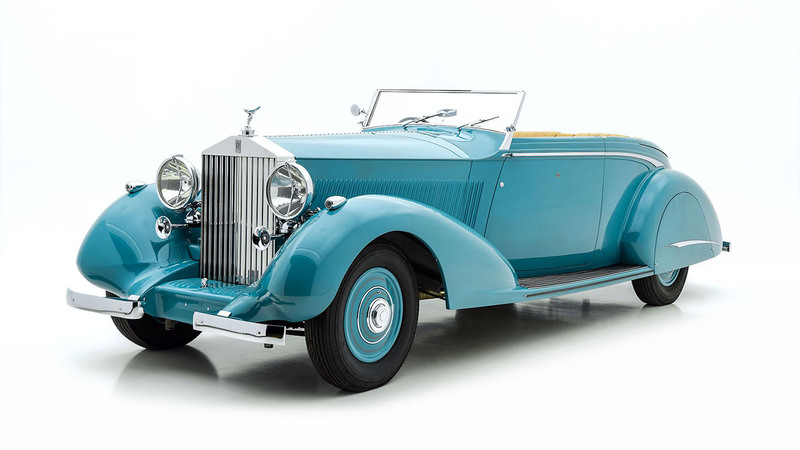 Stevens-Duryea entered receivership in 1922 emerging only to build cars to special order until 1927 at which time the doors were closed for good, the final chapter for this prestigious early American marque. 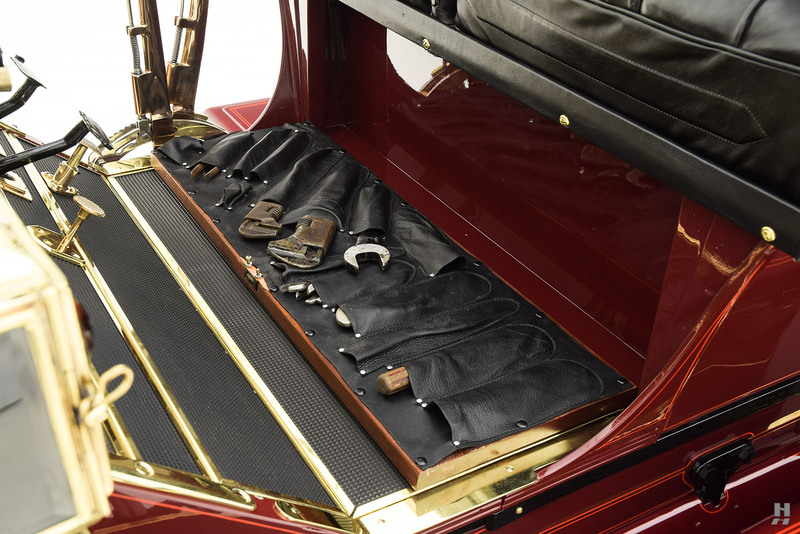 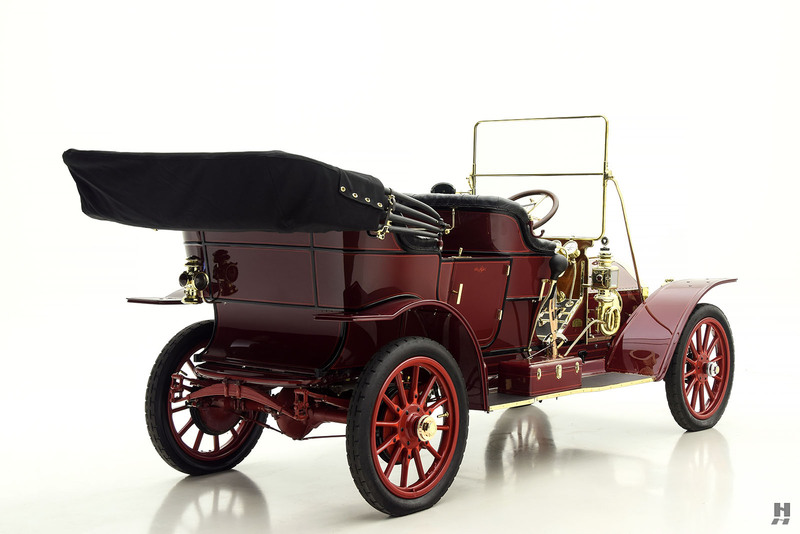 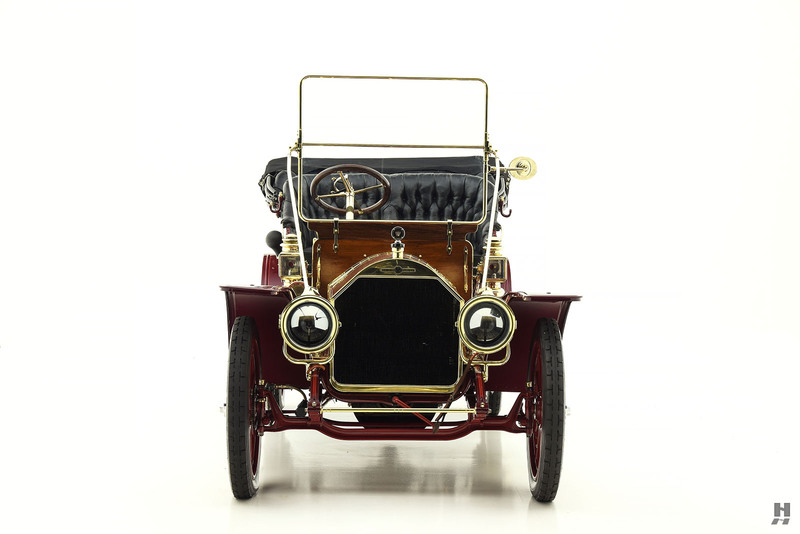 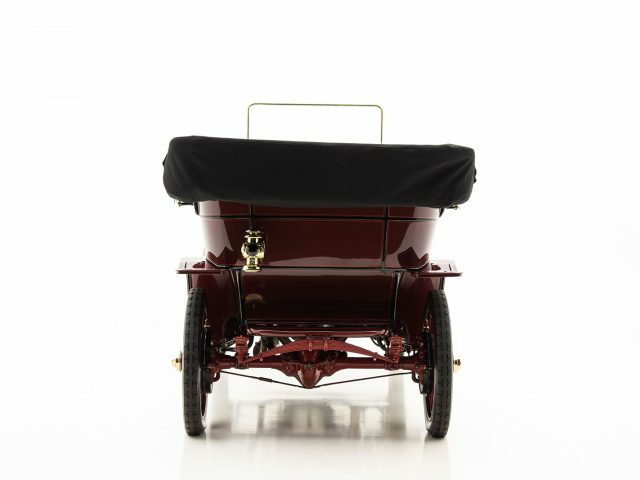 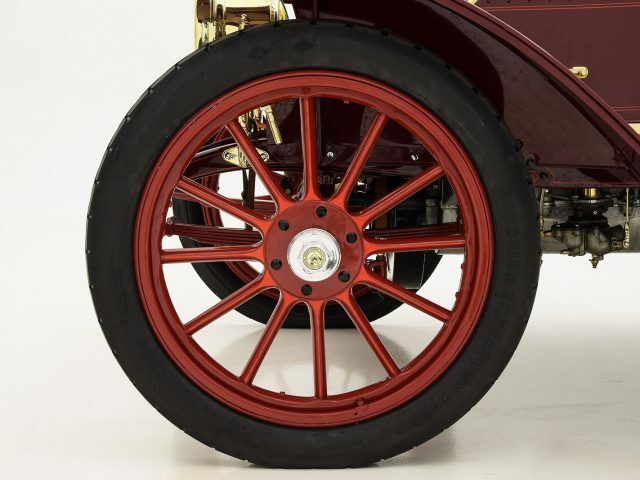 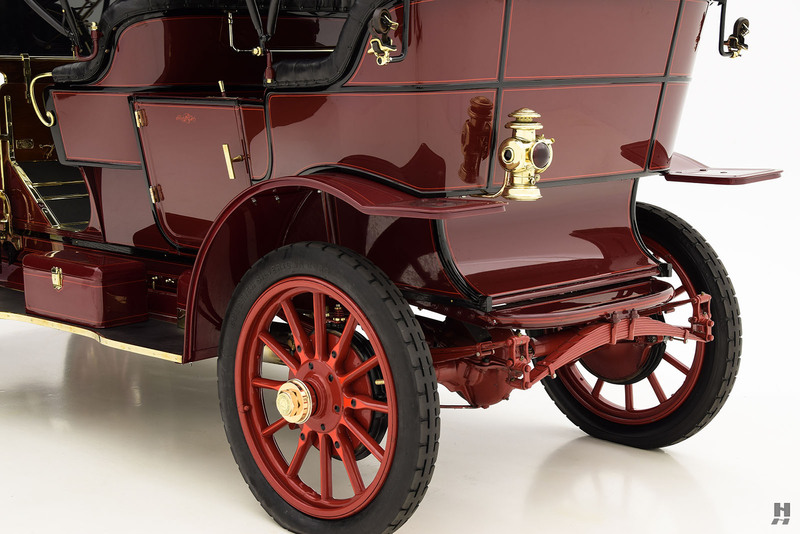 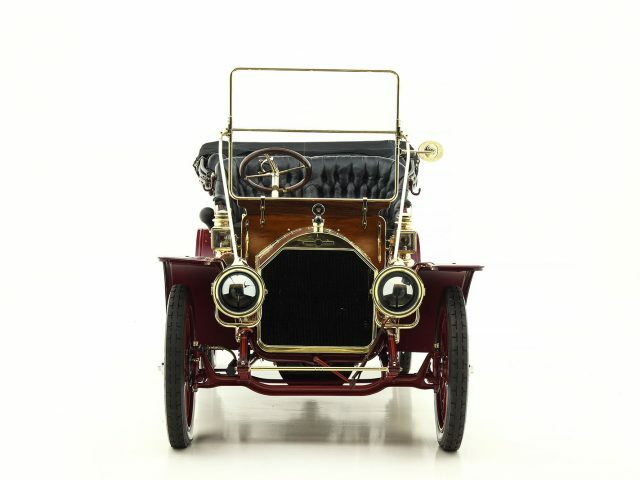 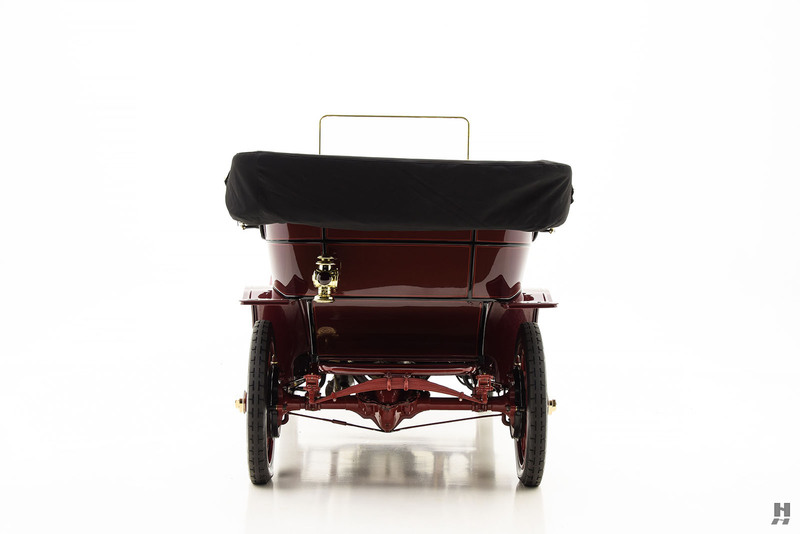 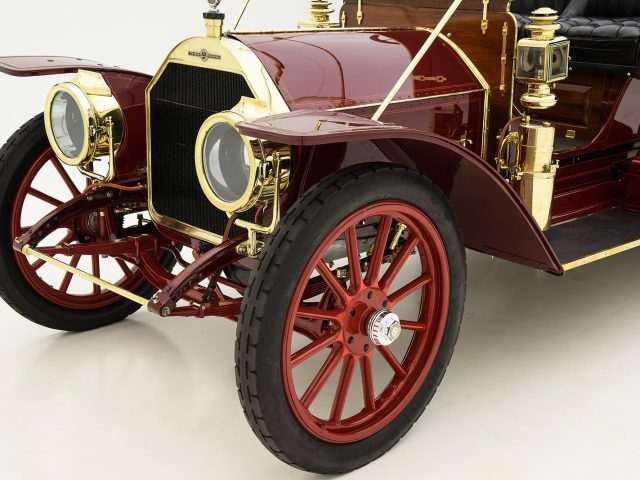 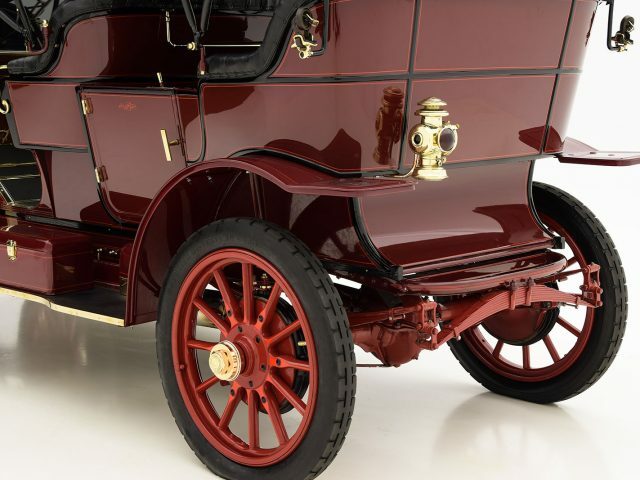 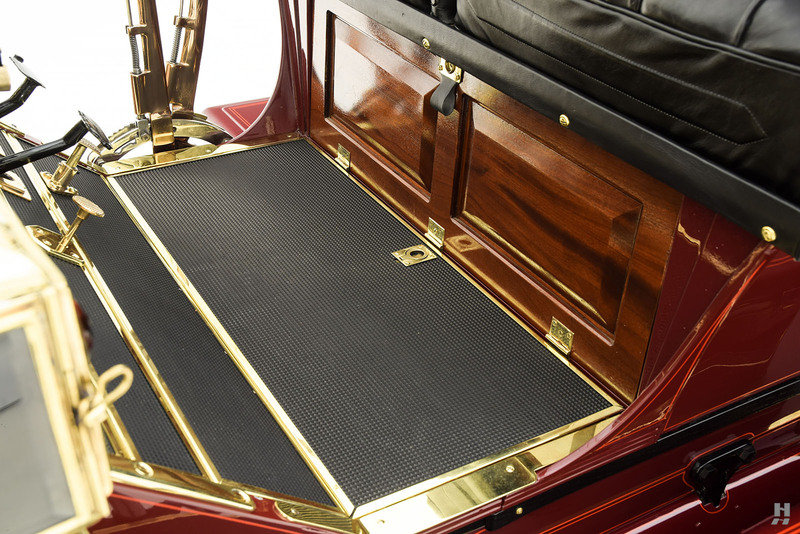 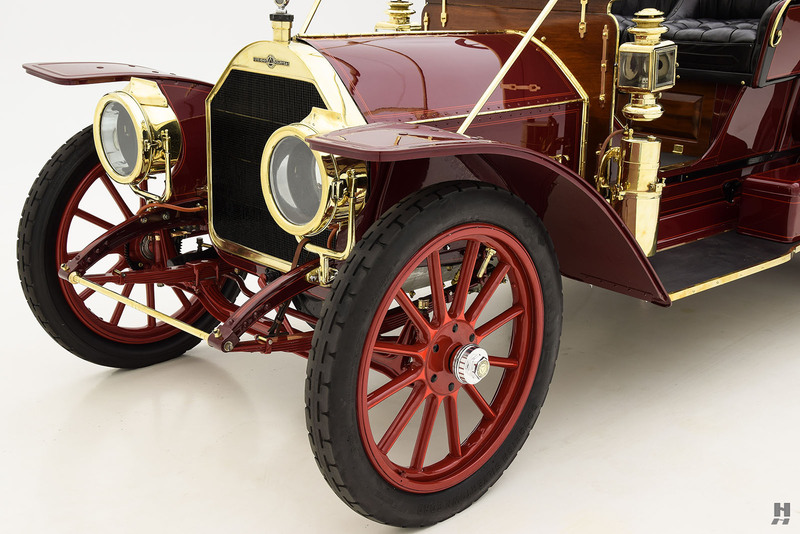 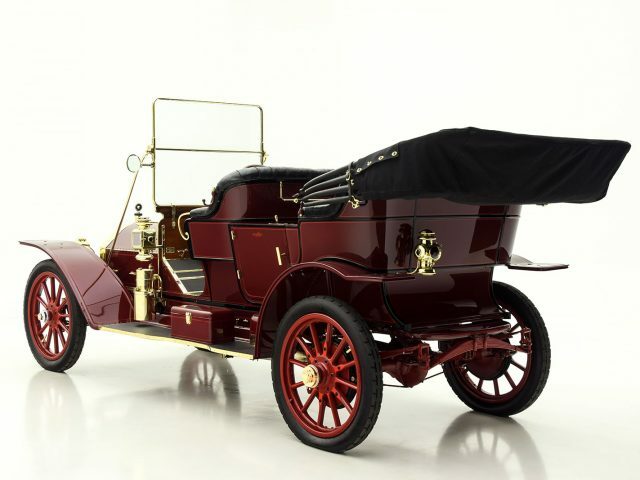 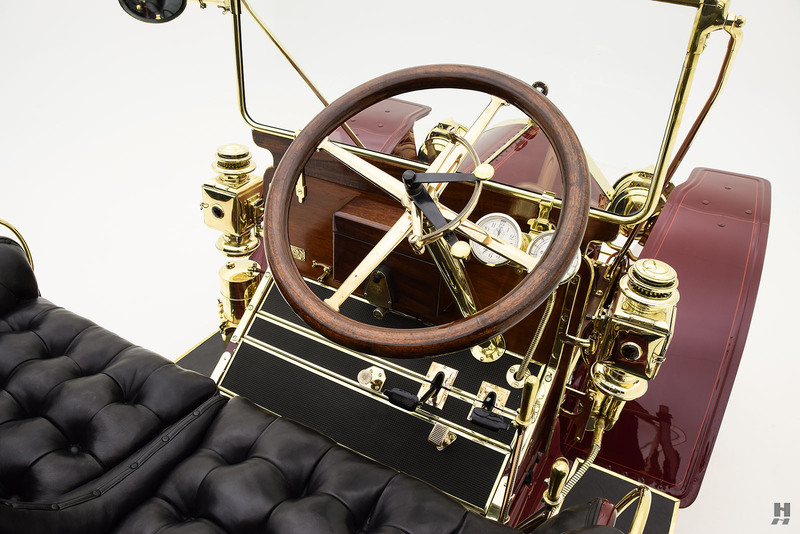 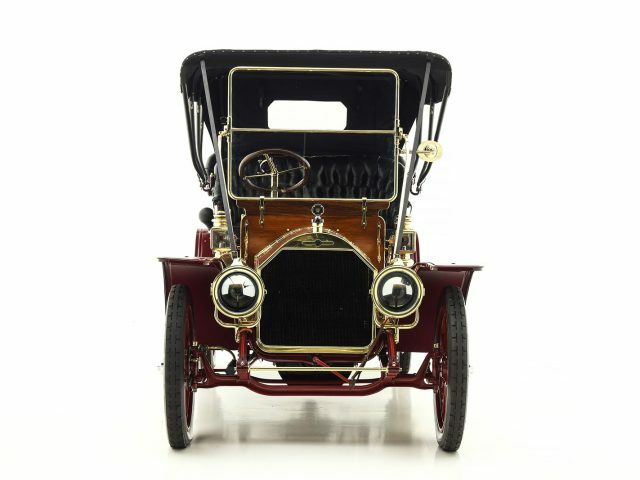 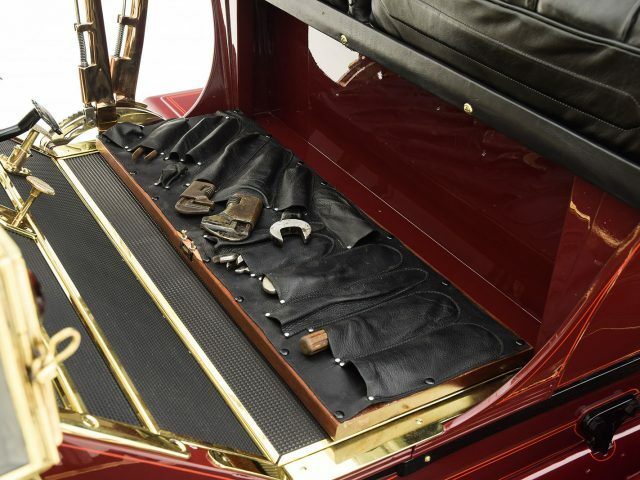 This lovely 1910 Stevens-Duryea Model X tourer was restored beginning in 2003 and completed in 2010 and has since proven itself as both a worthy show car and an outstanding tour car. 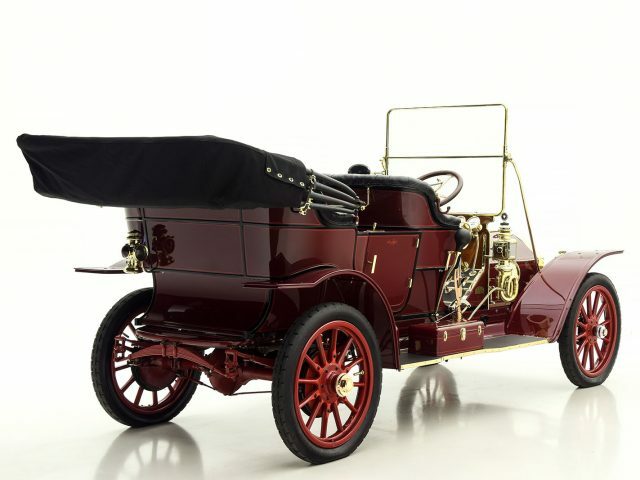 The Stevens-Duryea Model X was a prestigious automobile in its day; the 124” wheelbase machine costing $2850 in basic specification for 1910. 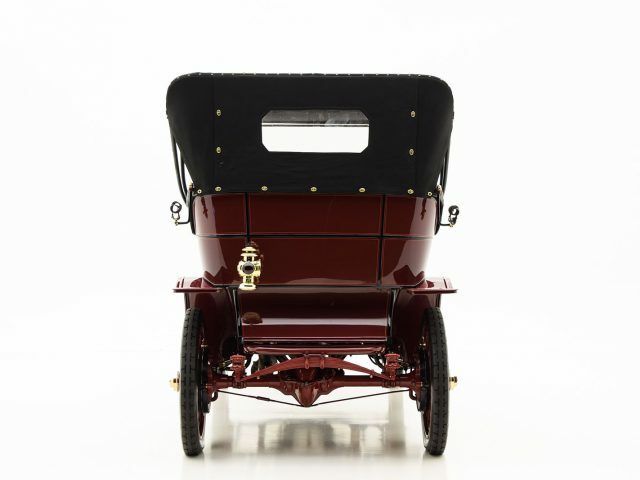 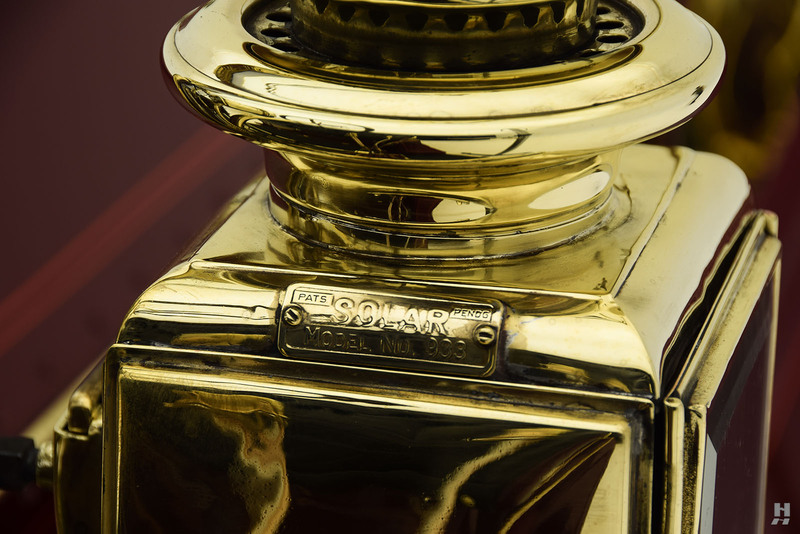 First purchased in 1910 by the Frank Cavin Family of California, #16330 remained in the family’s care until the 1950s. 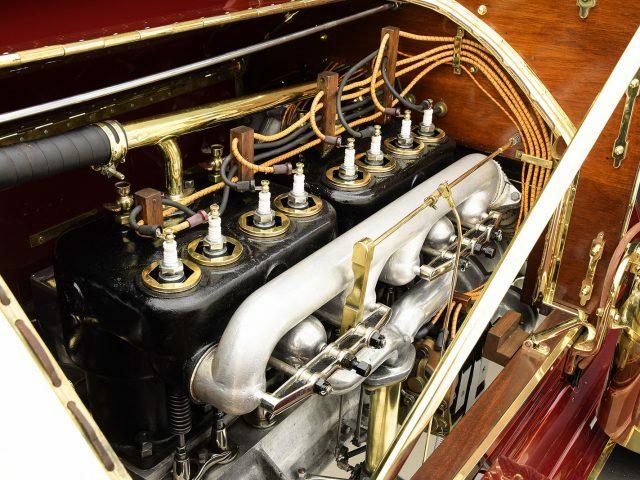 It was then passed to Warwick Eastwood, who was known by his peers in the Horseless Carriage Club as “Mr. 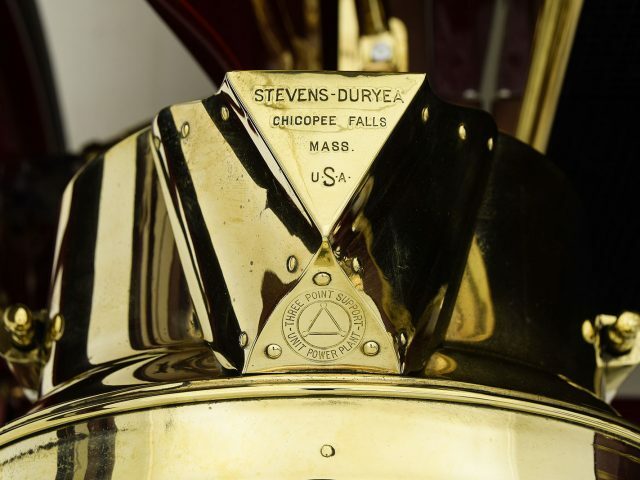 Stevens-Duryea”. 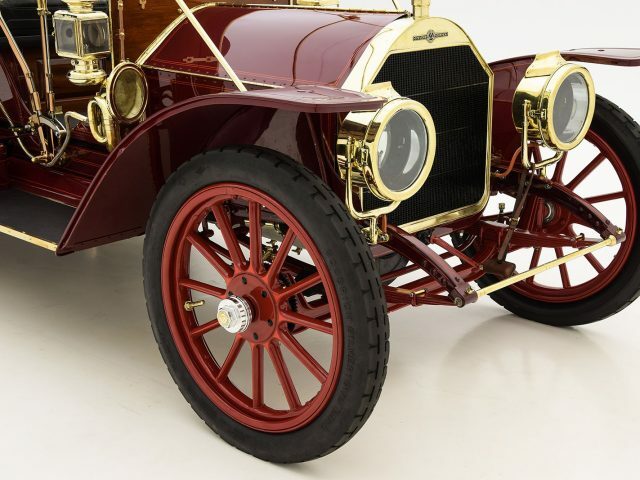 He began to track all Stevens-Duryeas and form a registry, and he maintained several examples, counting the Model X as his favorite of the marque. 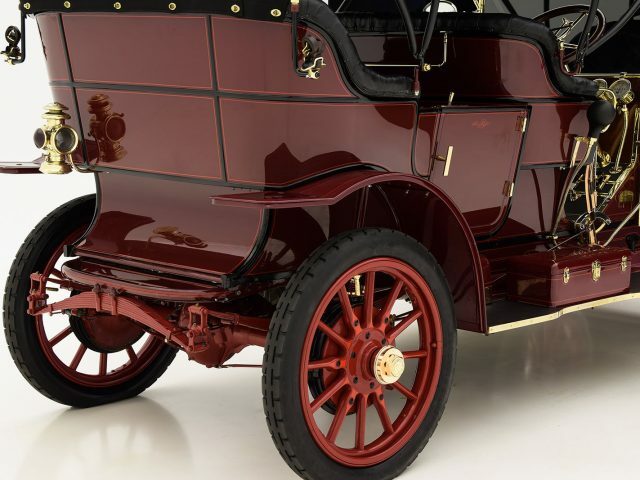 The car then passed through a few more hands before ending up with Mr. Bennett of Arizona who completed restoration of 16330 as it is appears today. 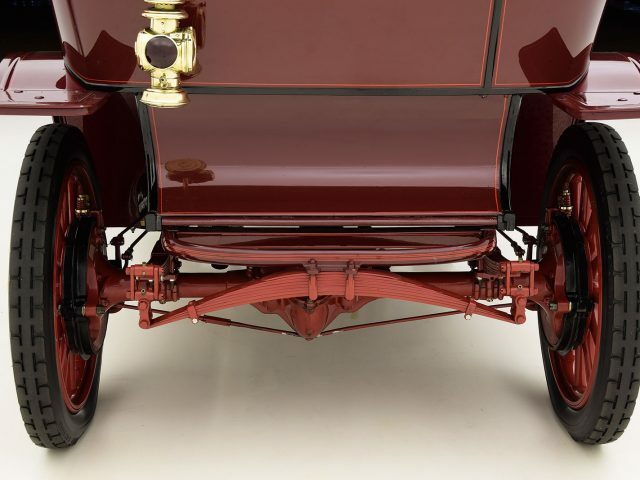 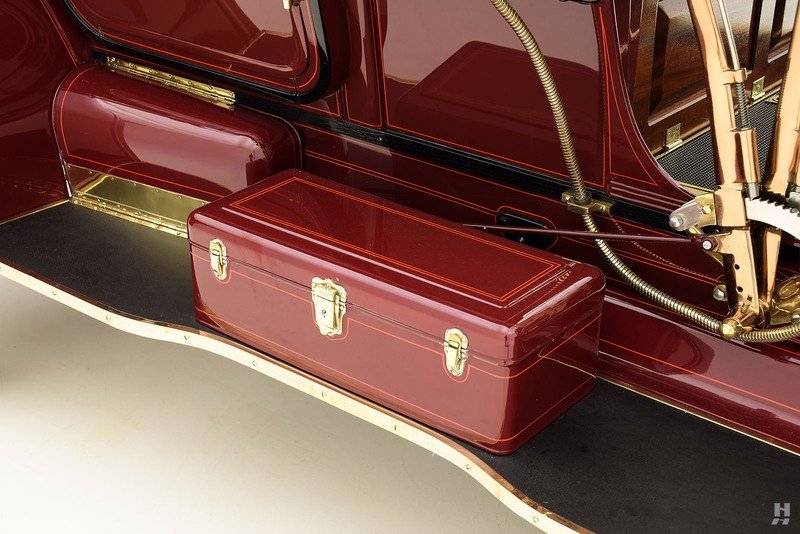 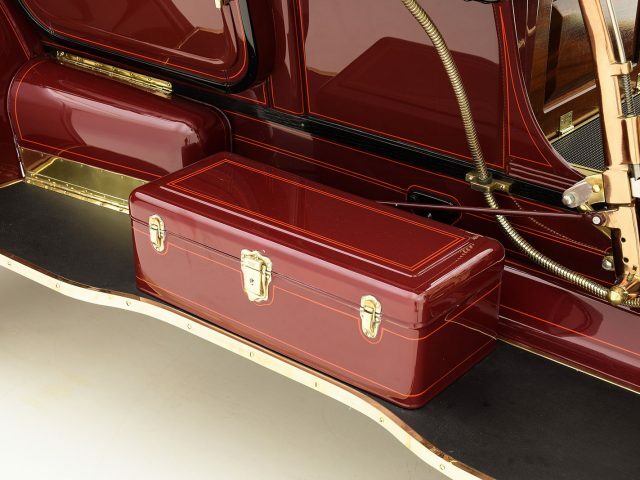 The presentation on this fine Model X is very handsome, with a maroon body with black accents and red coach lines, the theme continuing on the wood-spoke artillery wheels. 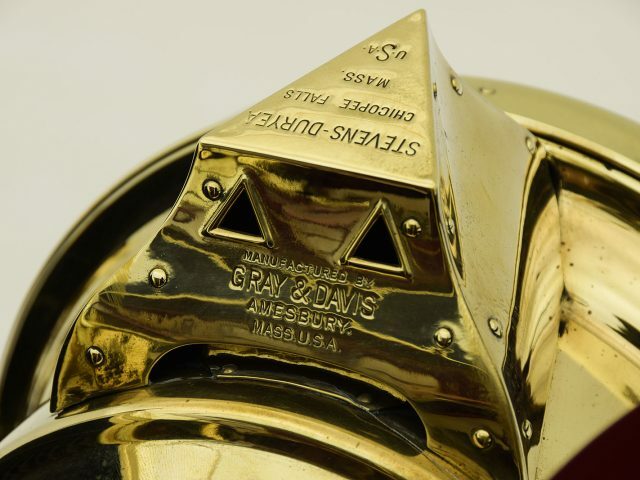 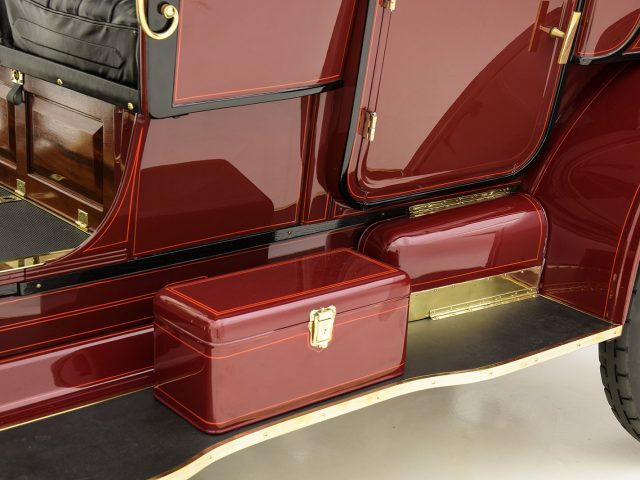 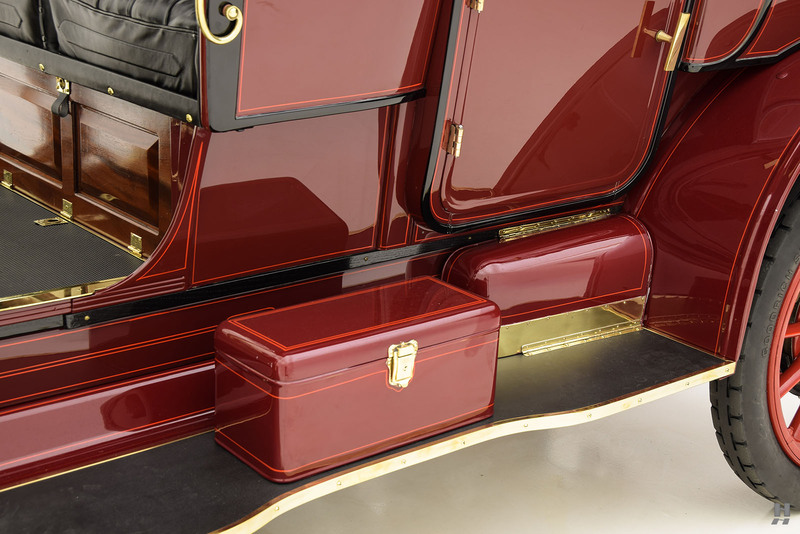 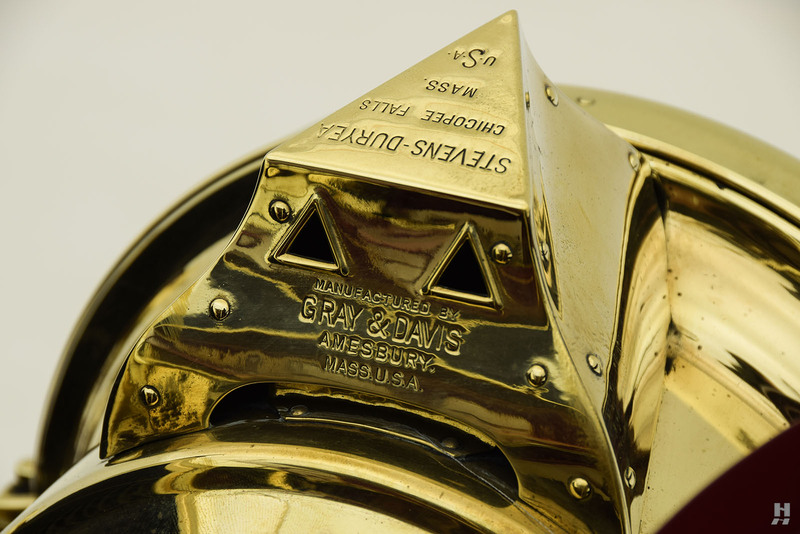 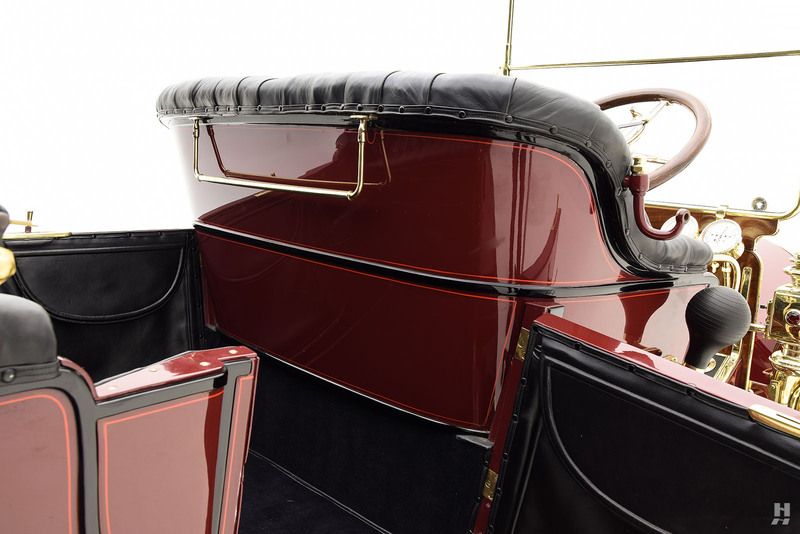 The quality of the restoration is excellent, with fine detailing and excellent quality finishing. 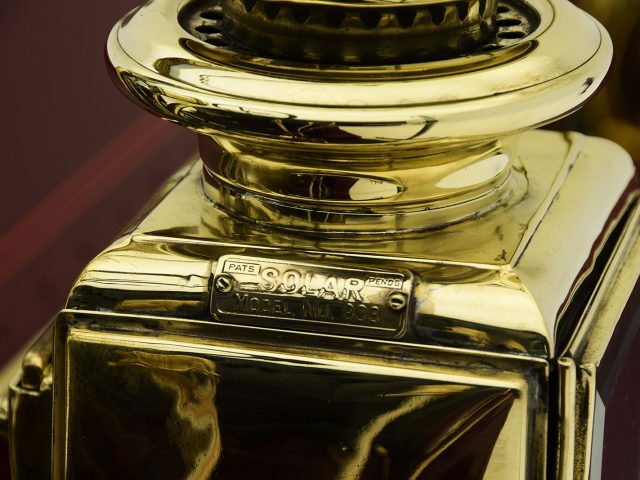 Brass fittings have been beautifully polished to a high gloss. 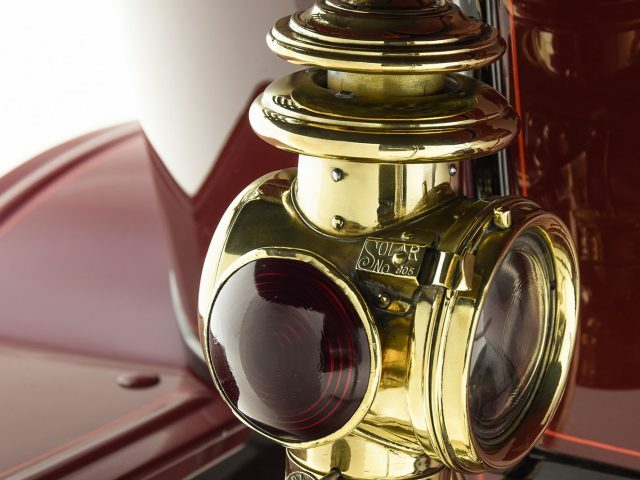 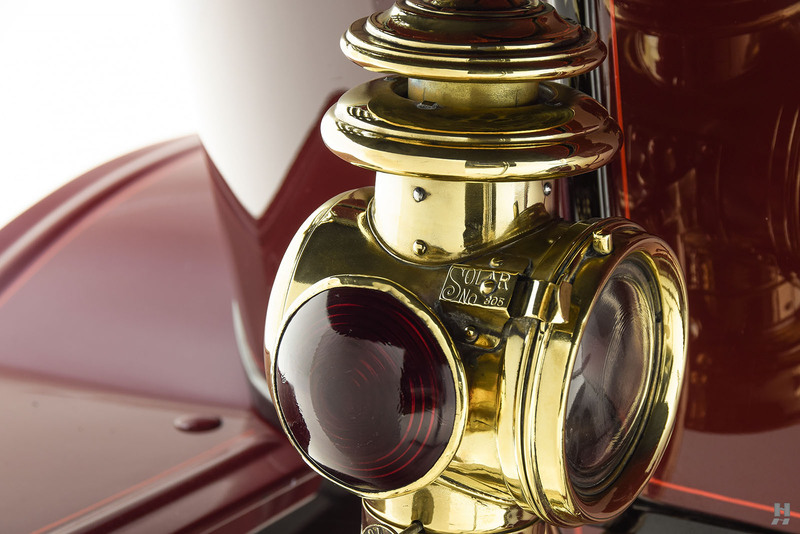 From the front, Stevens headlights flank a brass radiator shell which is topped with a Junior Arrow-Meter Motometer temp gauge. 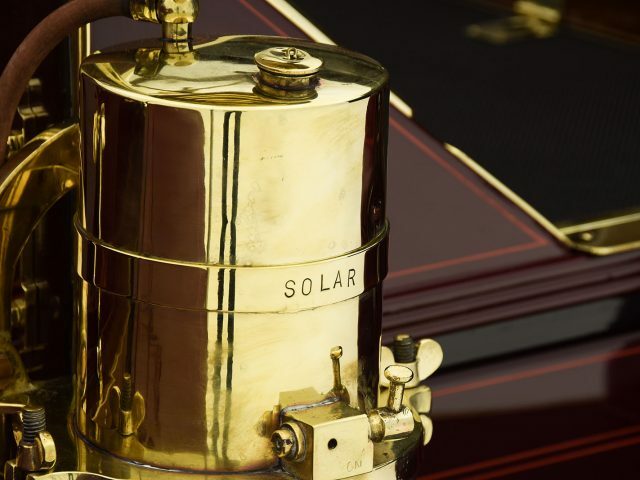 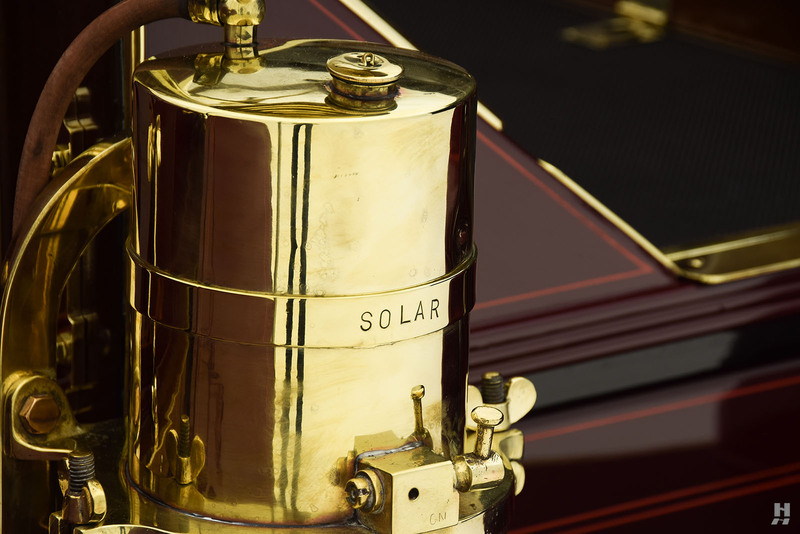 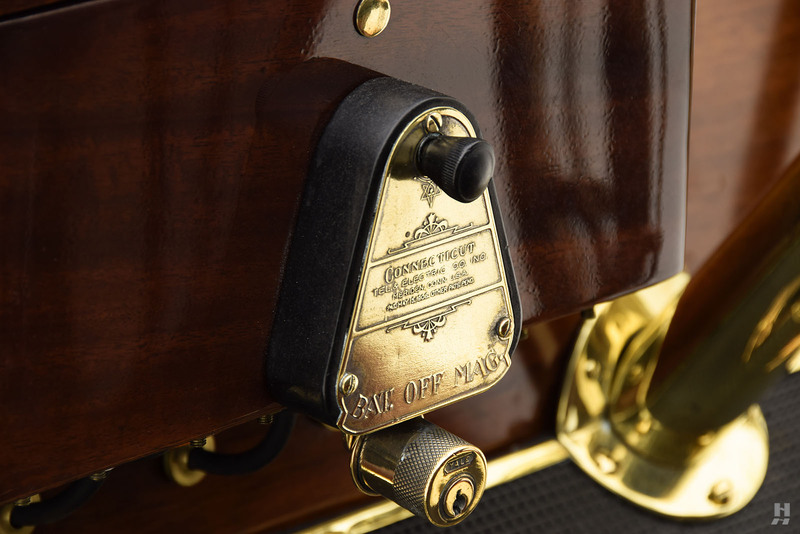 A pair of Solar coach lamps are affixed to the cowl, with a single stop light in the rear, and the lamps are powered by a Solar Acetylene tank on the running board. 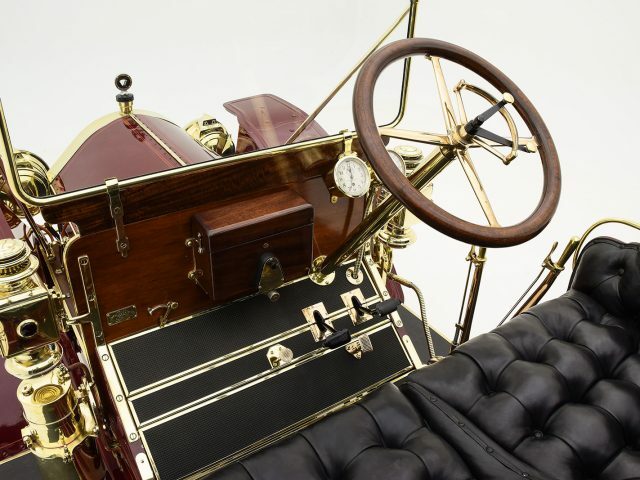 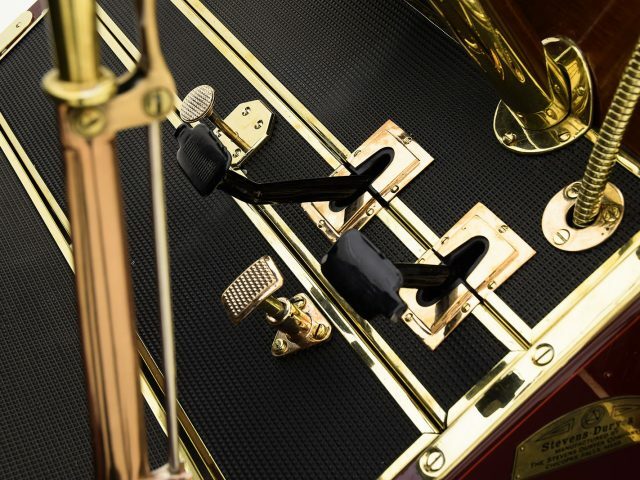 A big brass horn, brass windscreen frame and other hardware add plenty of visual appeal to this handsome touring car. 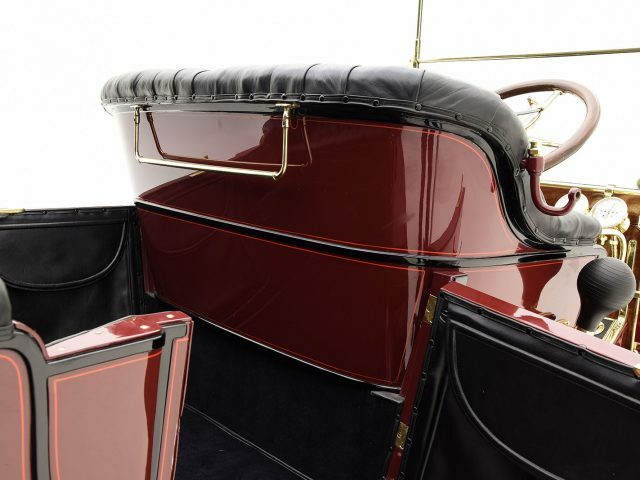 The expansive cabin accommodates five passengers, with seating upholstered in period-correct black buttoned leather which still appears very fresh and free of excessive wear. Pyramid-pattern rubber mats line the floors as original. 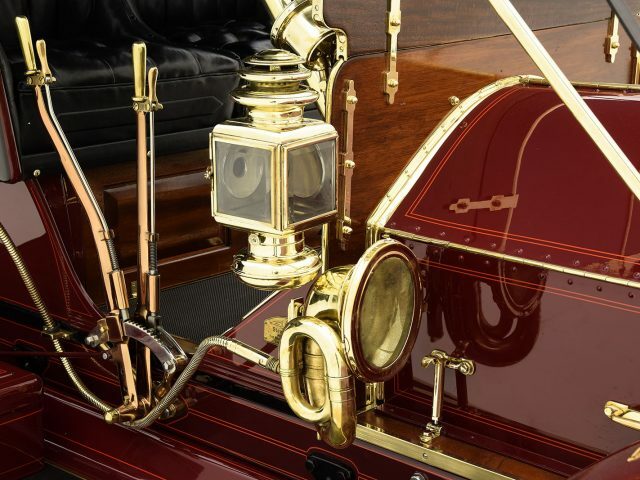 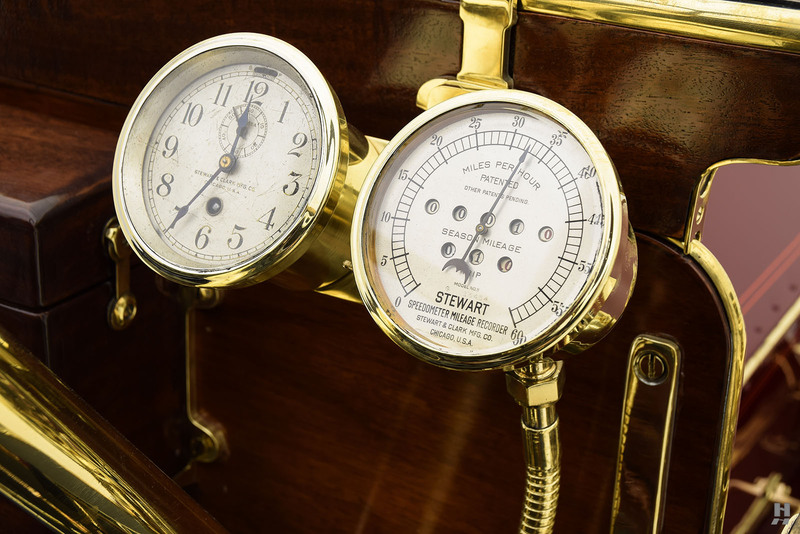 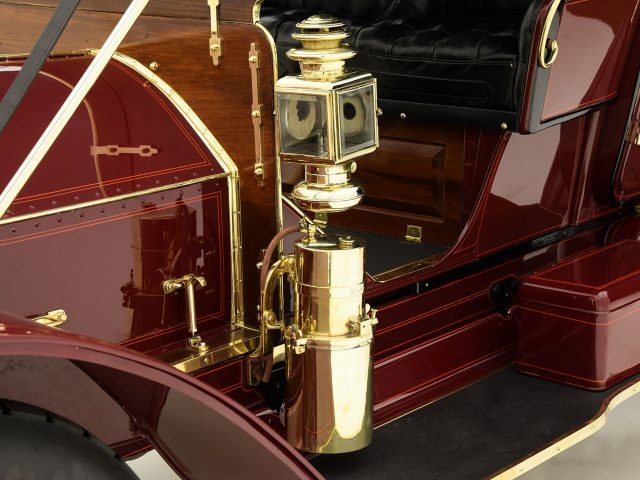 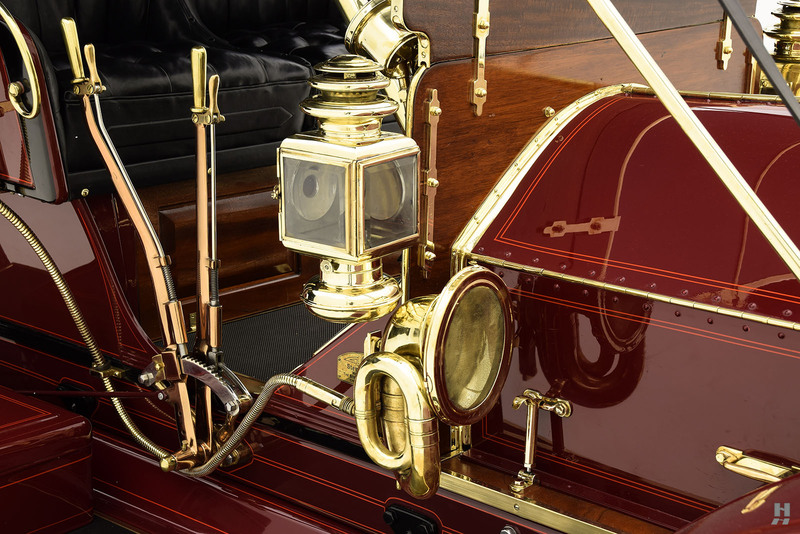 As typical for a brass-era automobile, instrumentation is limited, in this case a large Stewart speedometer and a Stewart-Clark clock give you all the information you need. 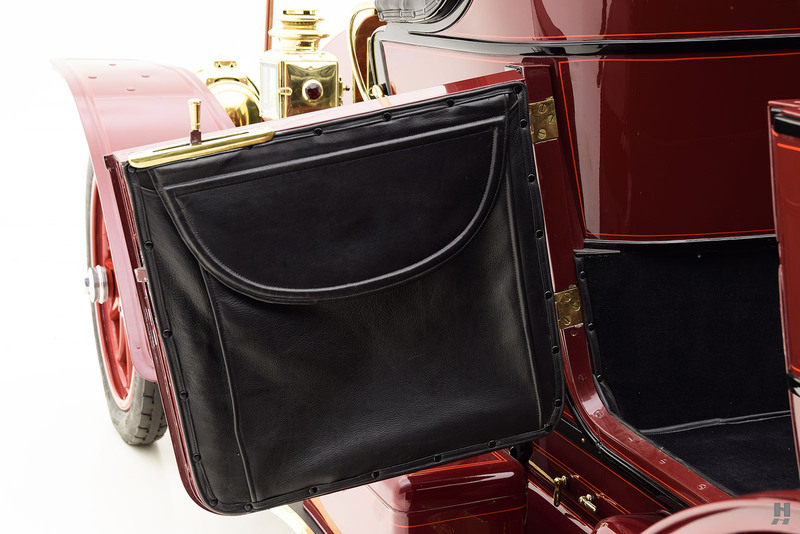 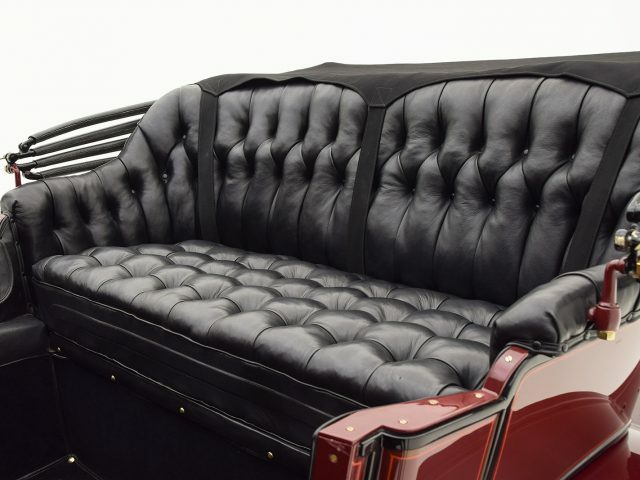 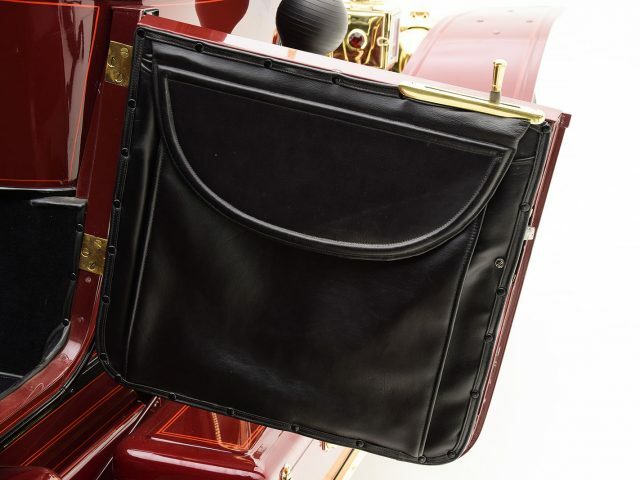 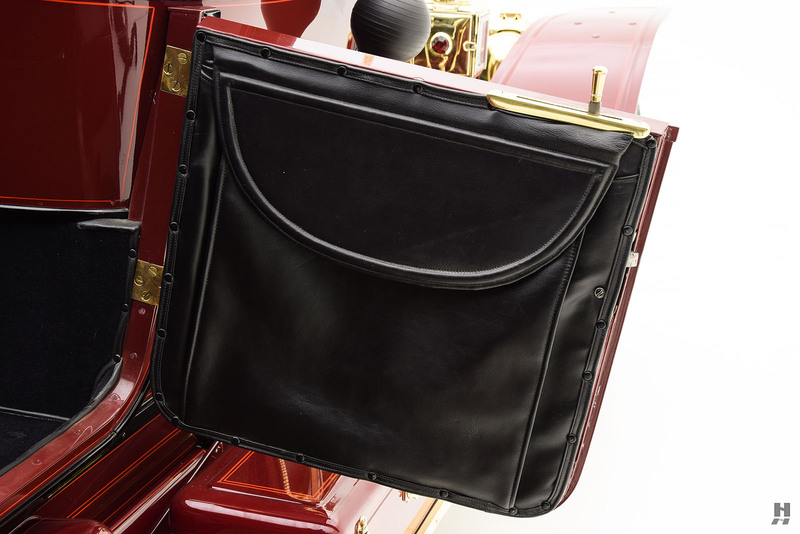 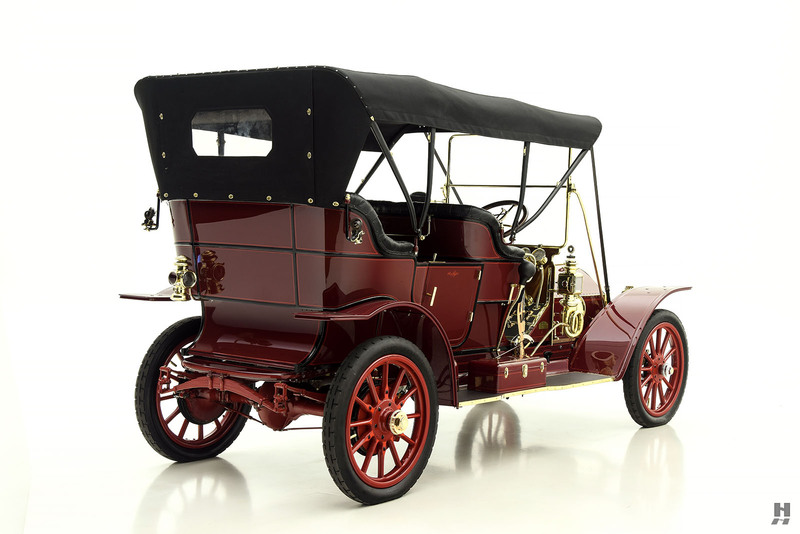 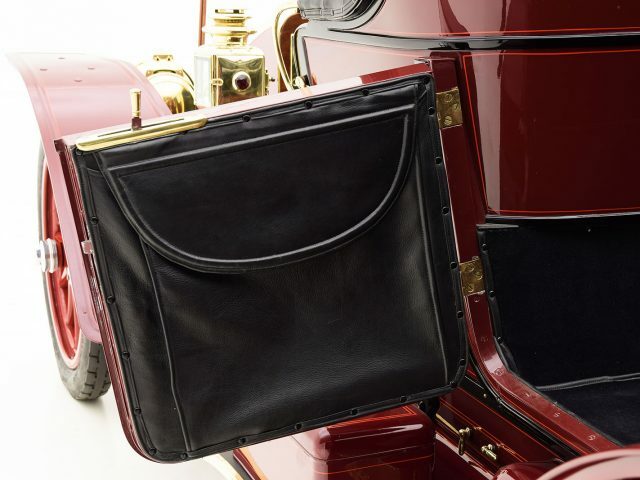 The split windscreen folds for a more open-air motoring experience, but should the weather take a turn, a full folding canvas top (an additional $150 option in 1910) keeps occupants protected. 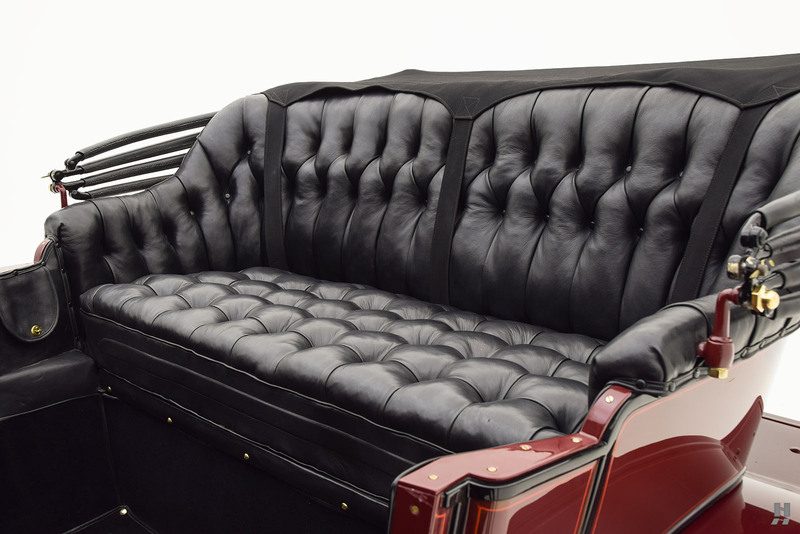 The top is in excellent condition, with very good fitment on the restored framework. 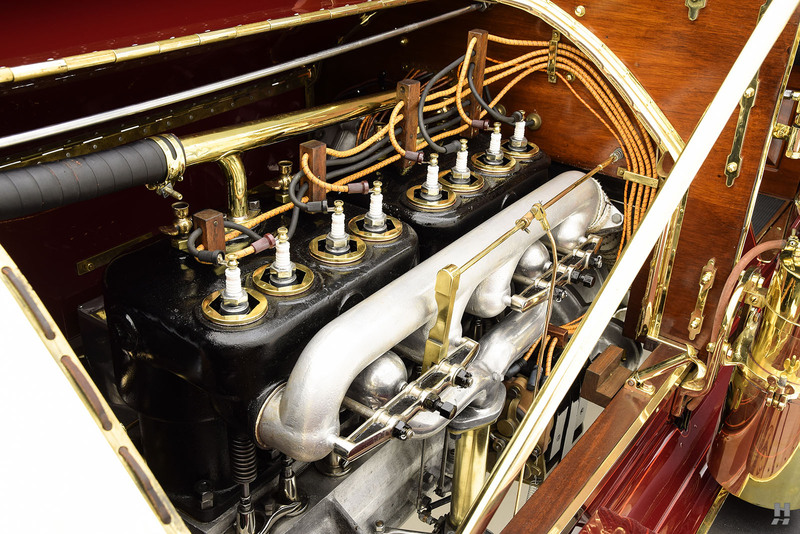 The reliable and robust T-head four cylinder engine, rated quite conservatively at 24 horsepower, presents very nicely, with proper, period appropriate detailing. 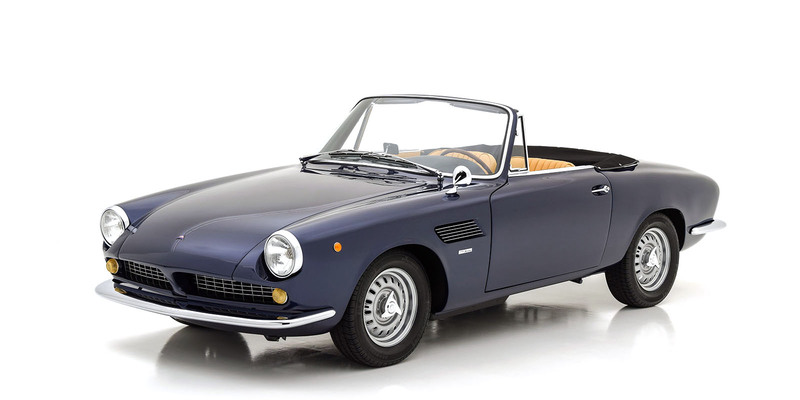 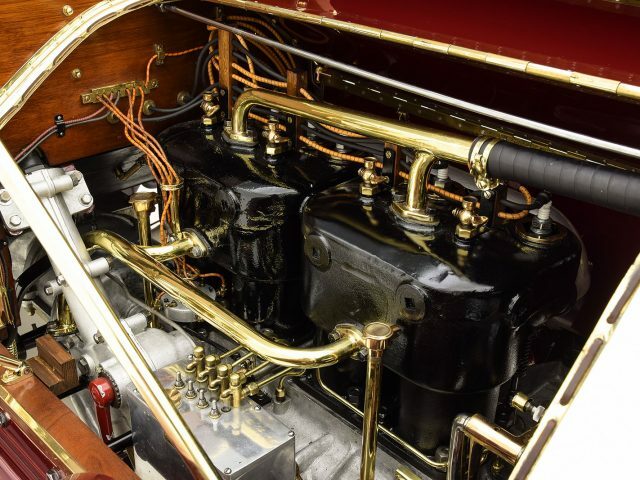 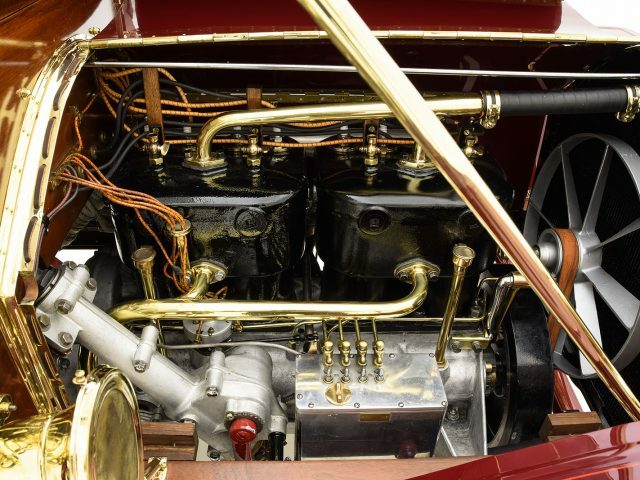 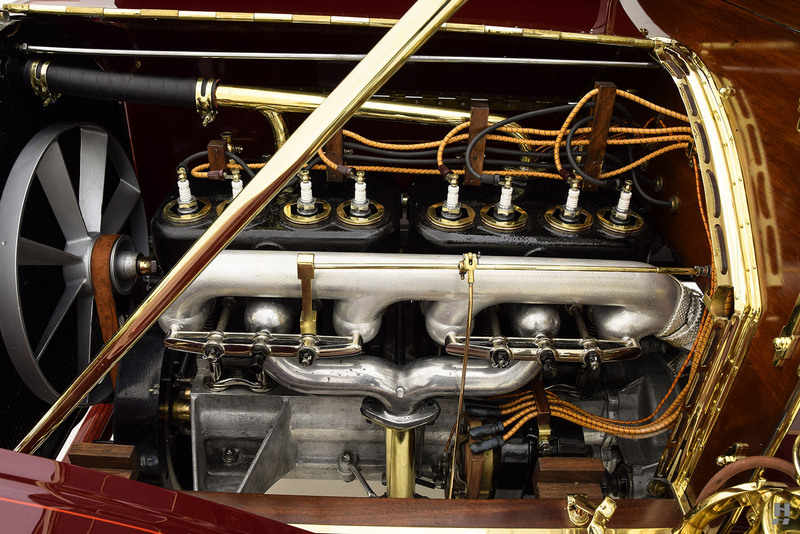 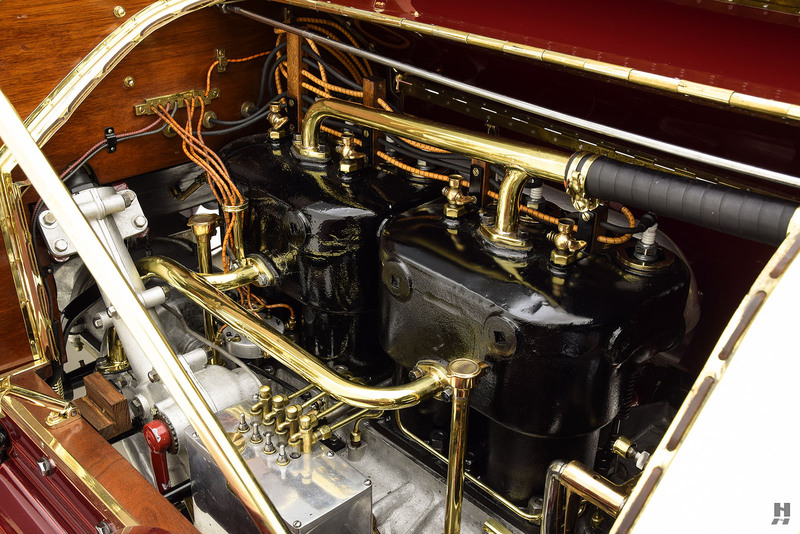 Since the restoration, the engine remains very tidy and certainly worthy of show, it has been proven on tour in the hands of its most recent owner. 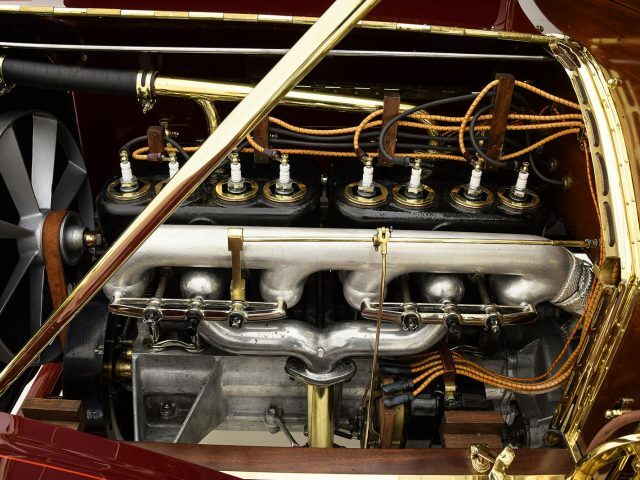 It runs strong, starts easily and provides prodigious torque. 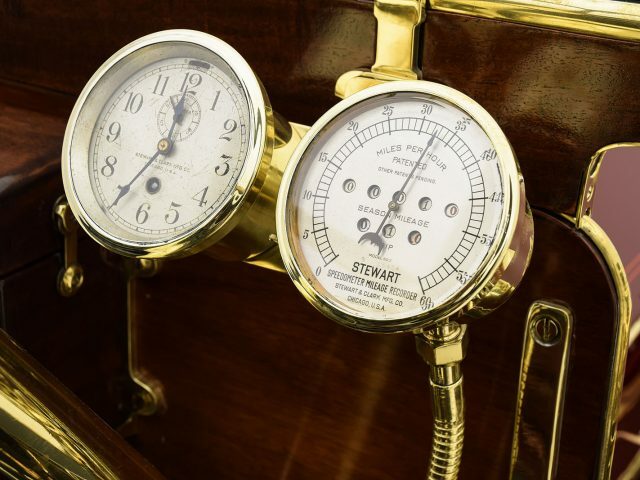 Period advertising material touted the Stevens-Duryea’s “Standardized Operating Levers” and “self-finding quadrant” gear change which allowed for easy operation as opposed to some more complex arrangements of their competitors. 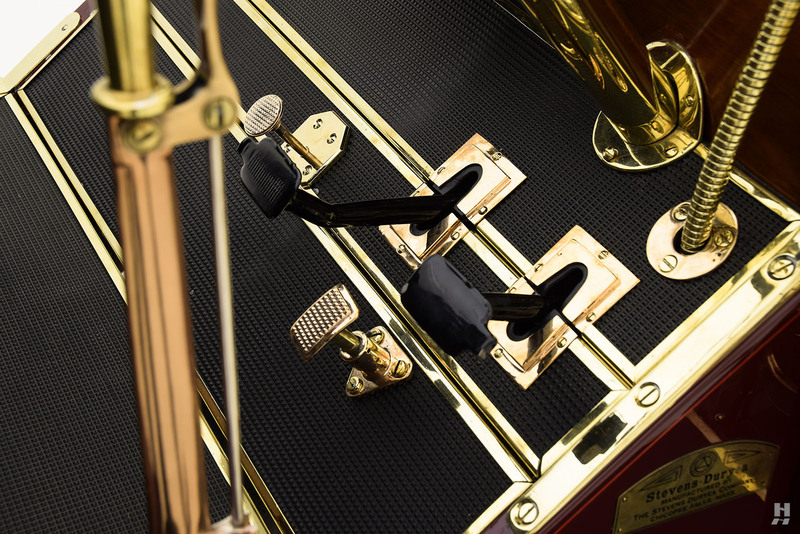 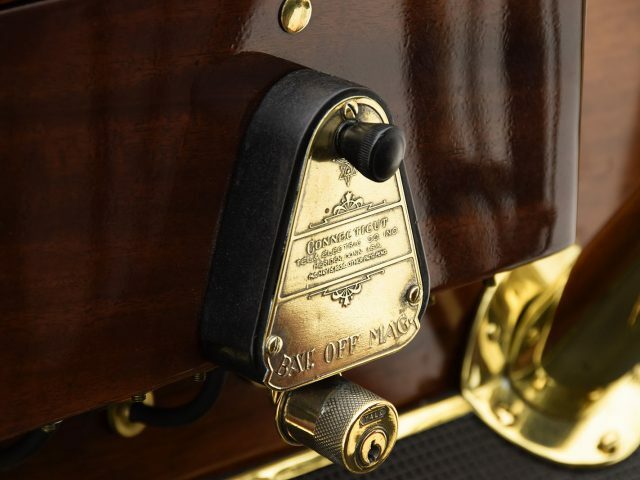 The ease of operation still rings true today, as this motorcar is a delight to drive and is very approachable even for brass-car novices. 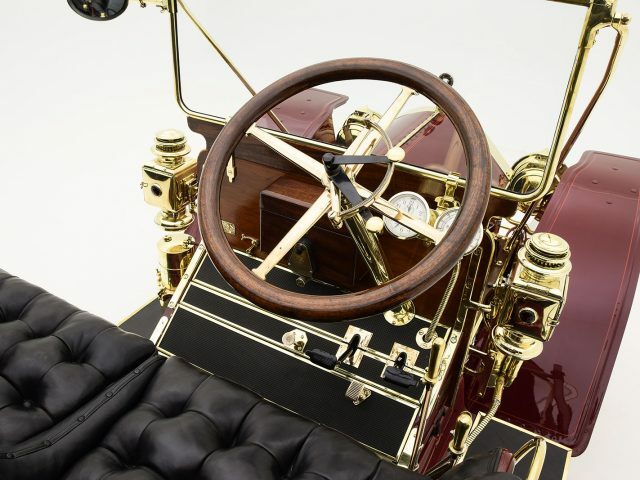 There is no experience quite like that of piloting an automobile that is more than a century old. 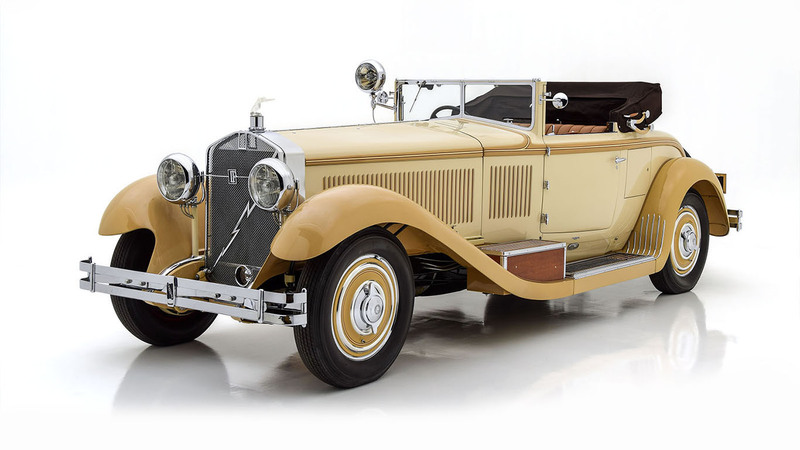 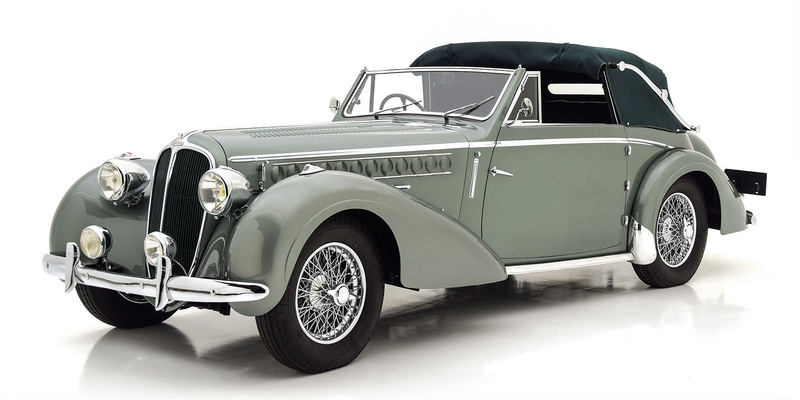 This Stevens-Duryea is a wonderful example that has proven itself as a reliable, enjoyable tour car yet remains beautiful enough to be shown with pride.